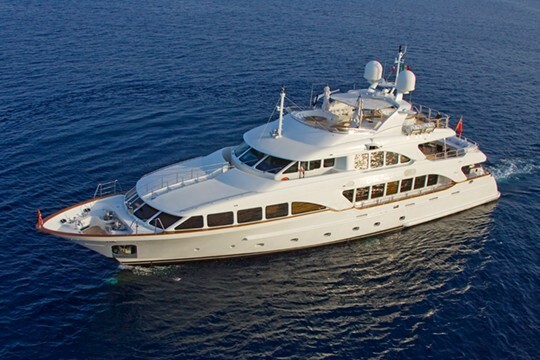 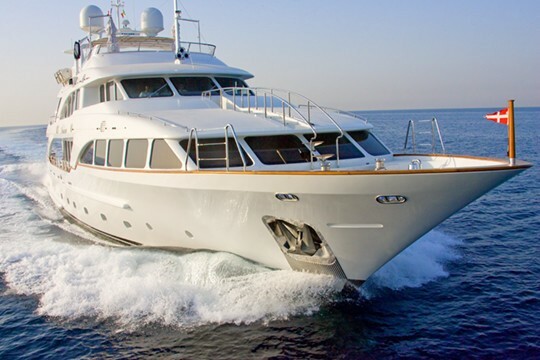 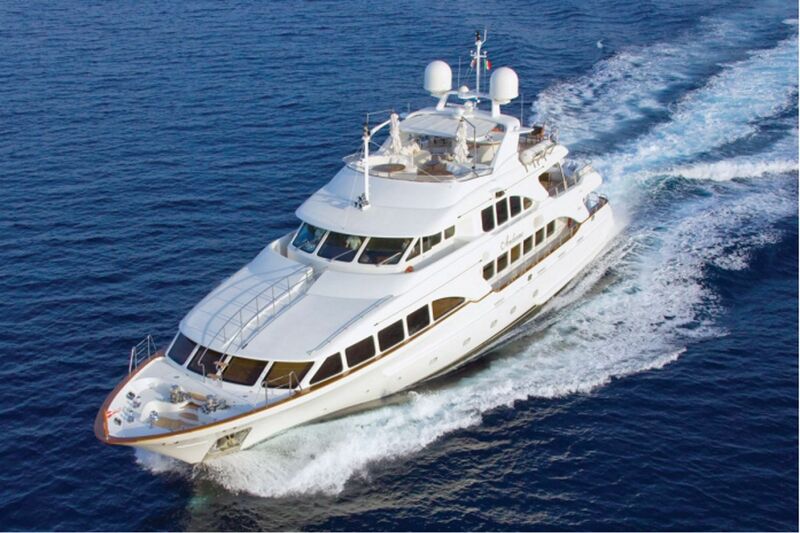 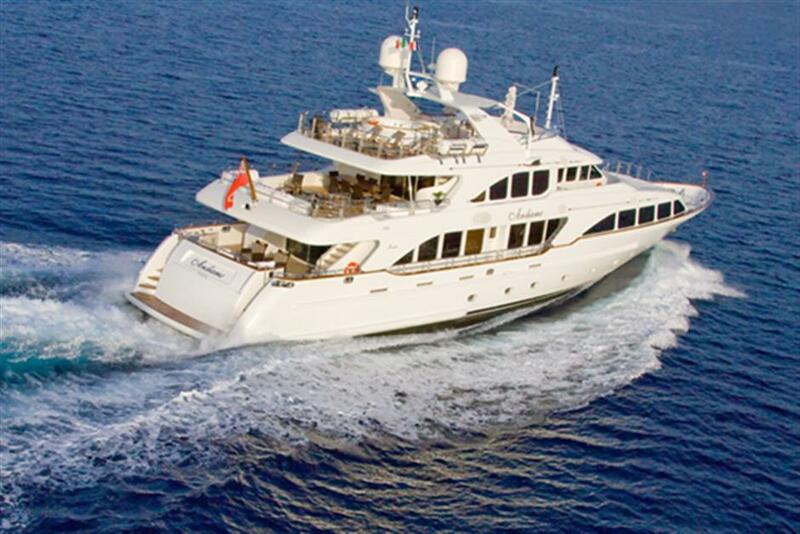 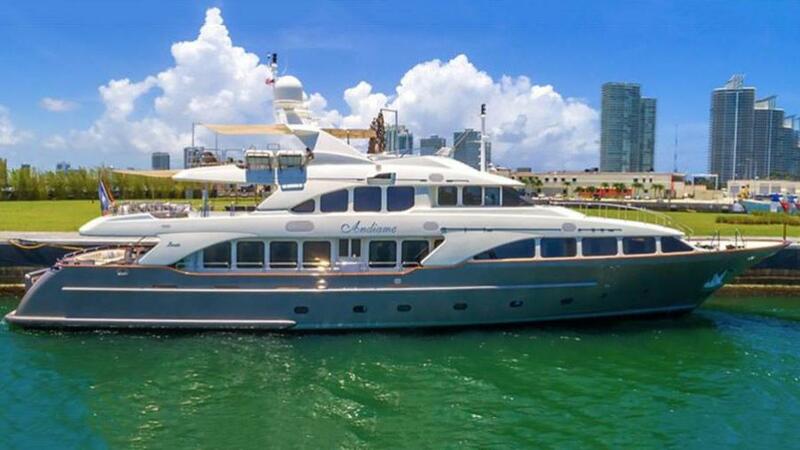 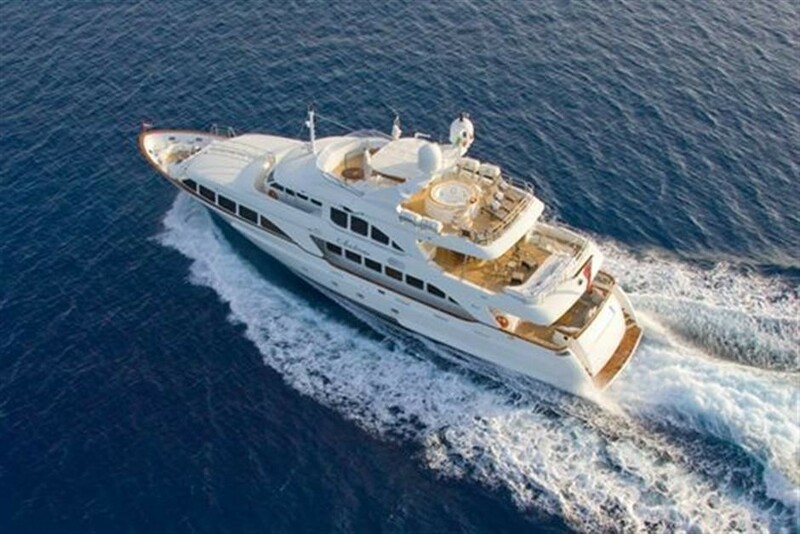 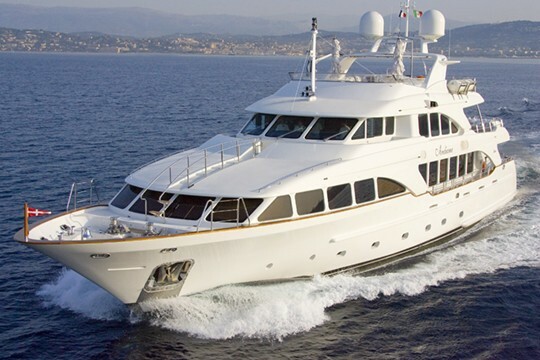 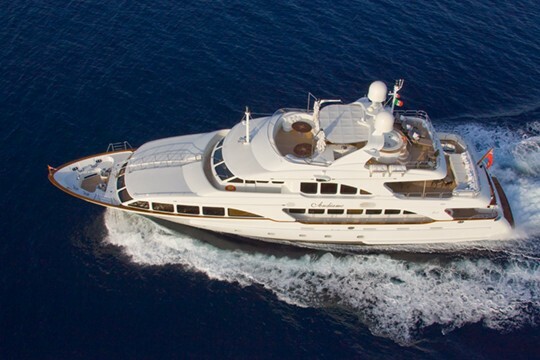 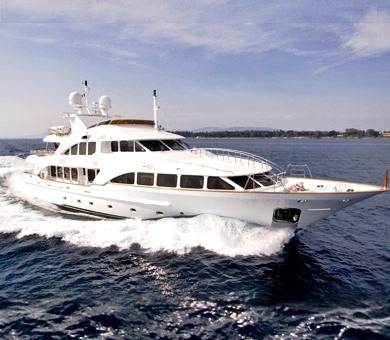 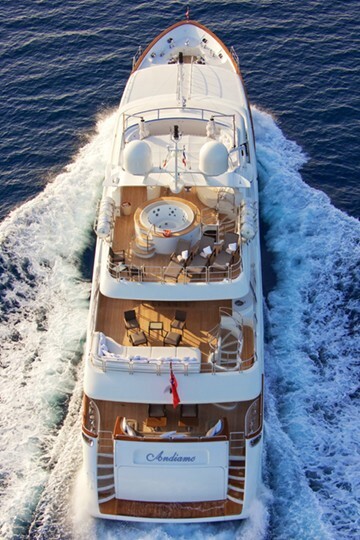 Motor yacht ANDIAMO is a 36.60m (120’) Benetti Classic luxury yacht able to accommodate up to 10 guests. 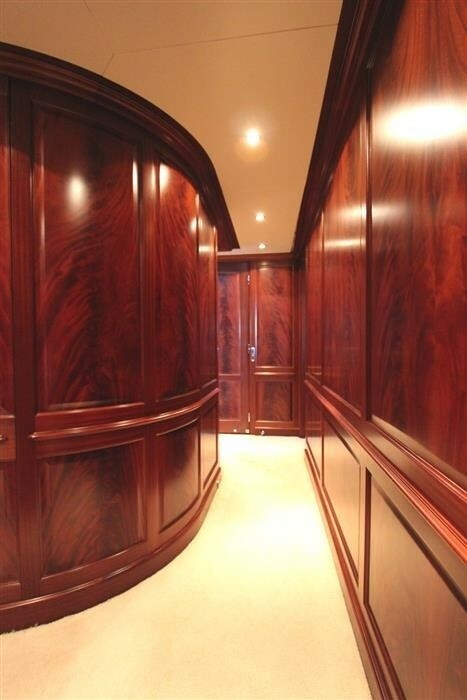 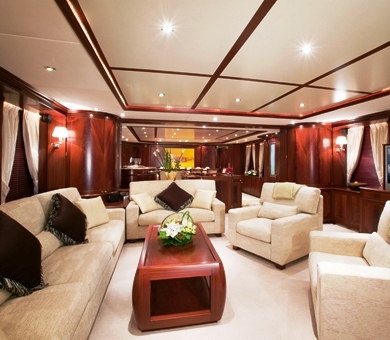 She has considerable interior space, decorated in an opulent style with rich mahogany panelling, pale brown onyx surfaces and cream carpets. 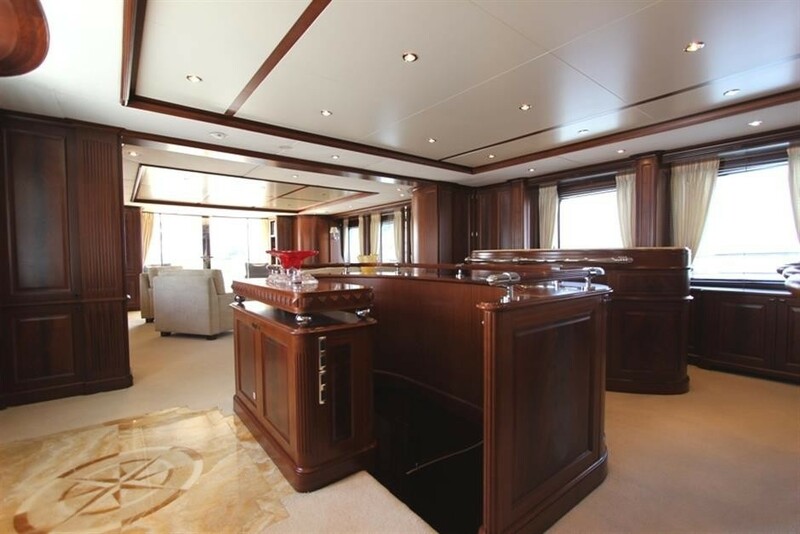 She has an extensive refit in 2016. 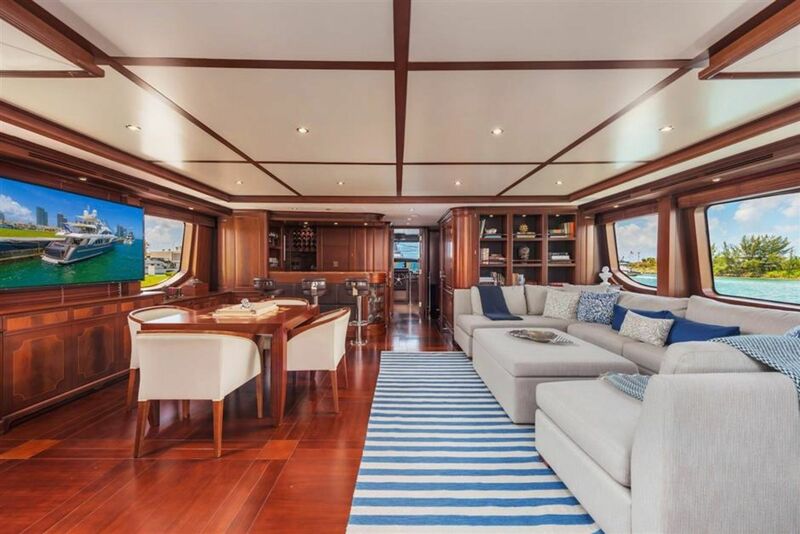 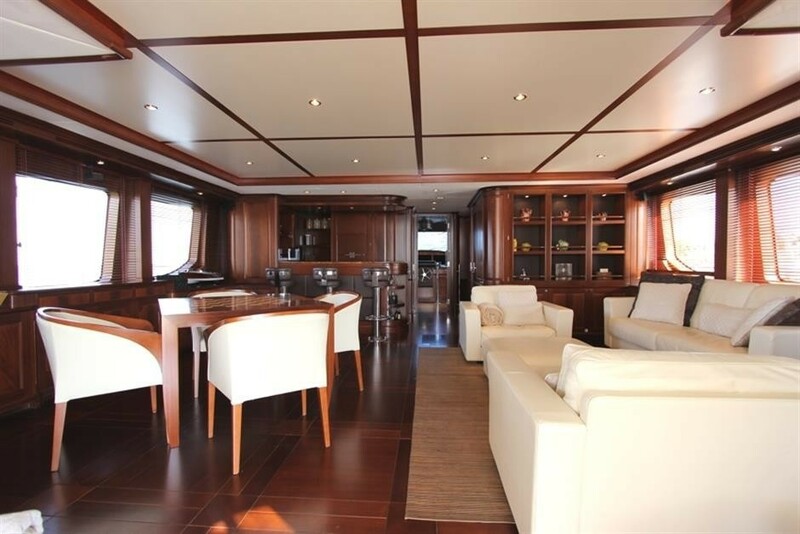 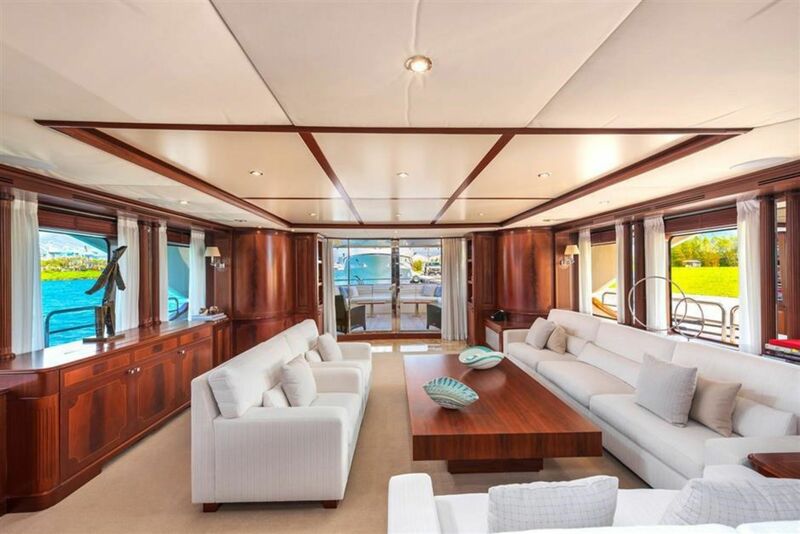 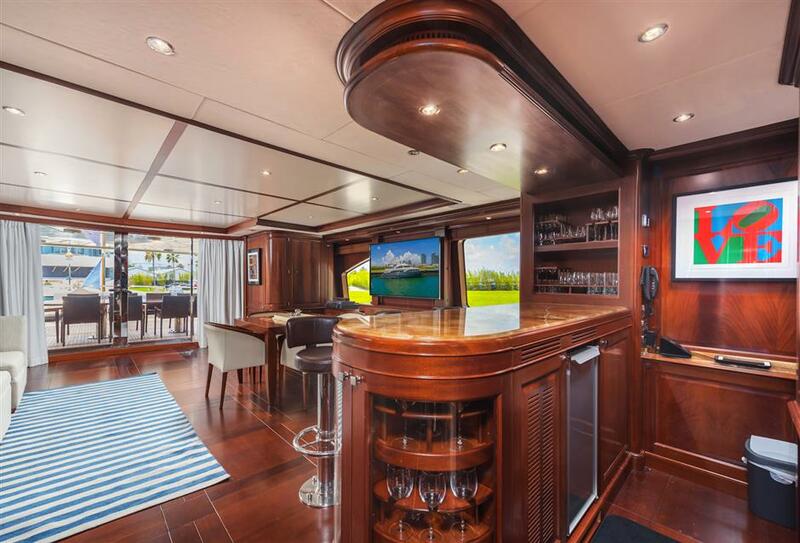 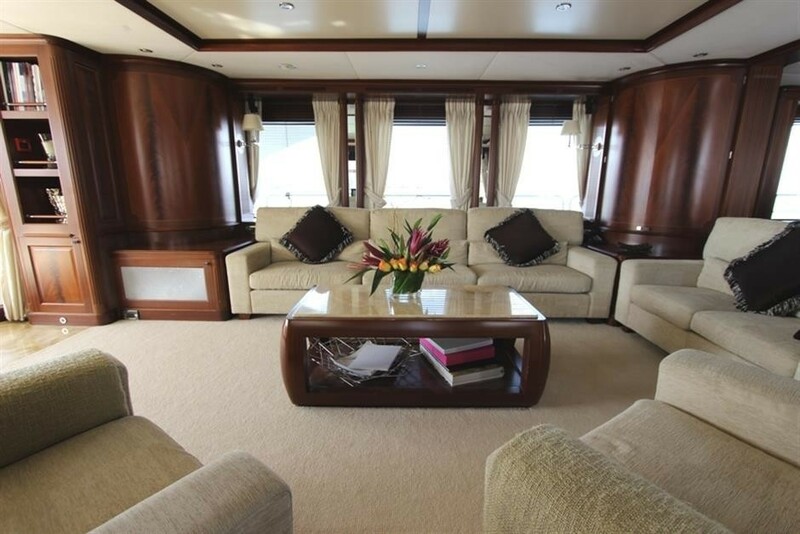 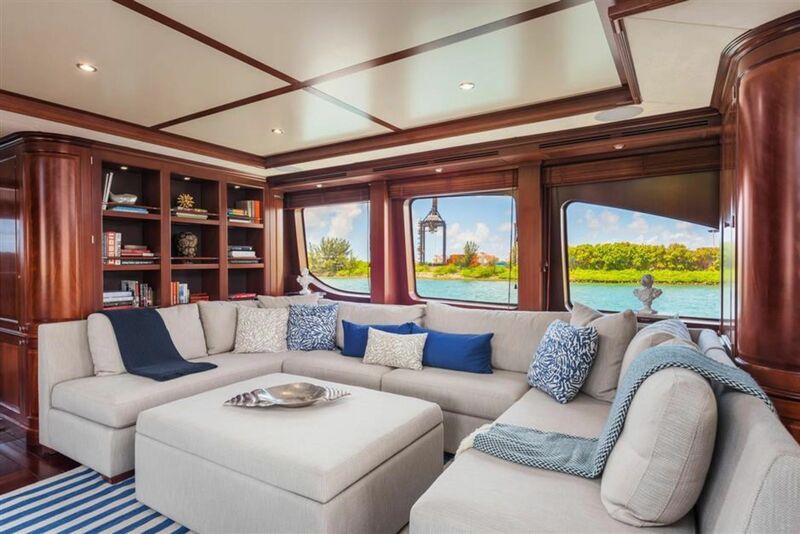 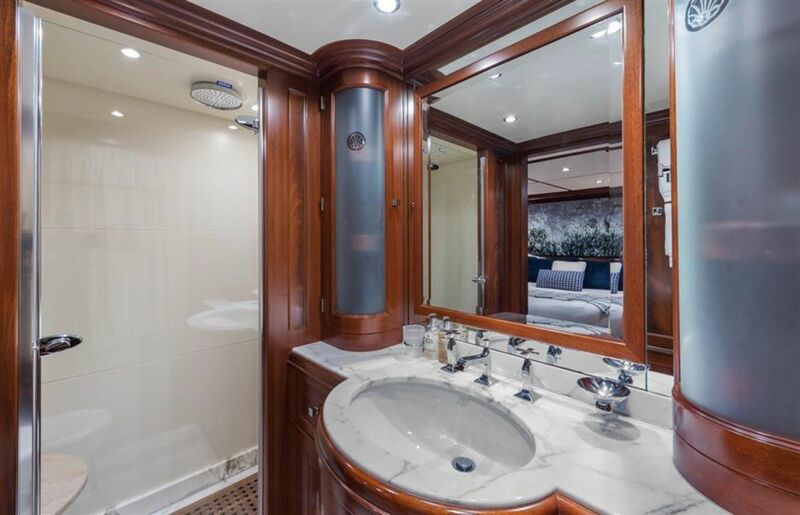 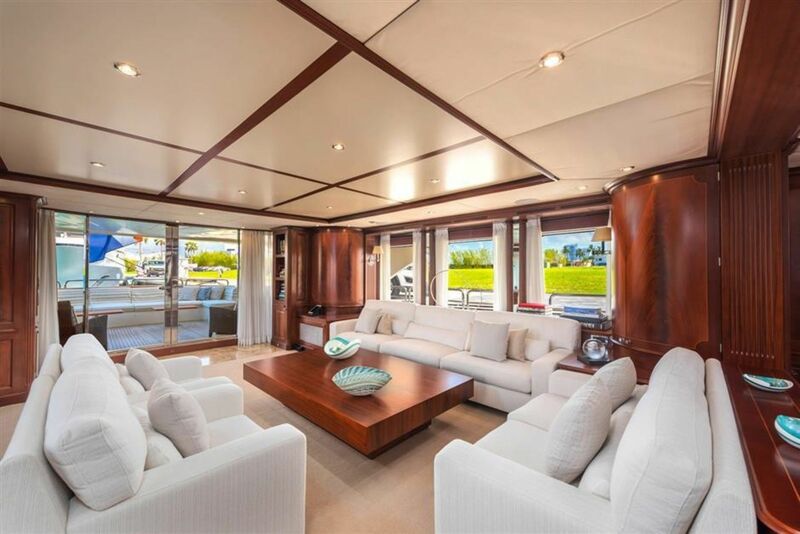 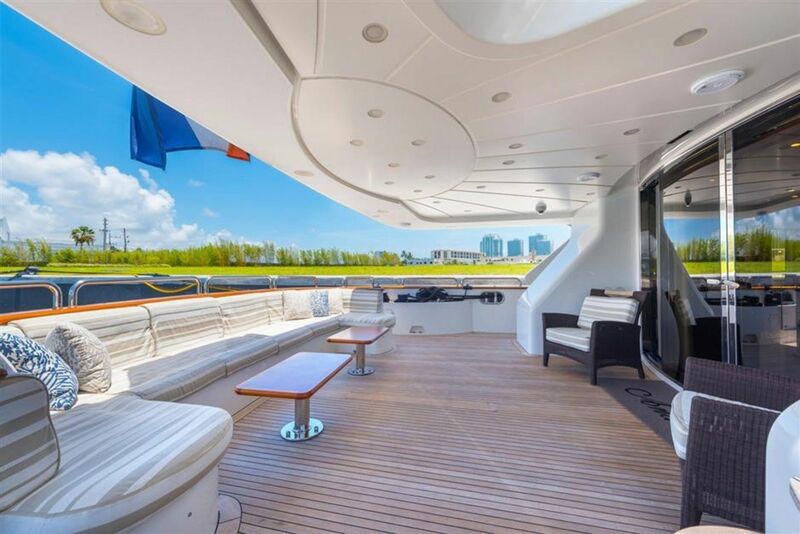 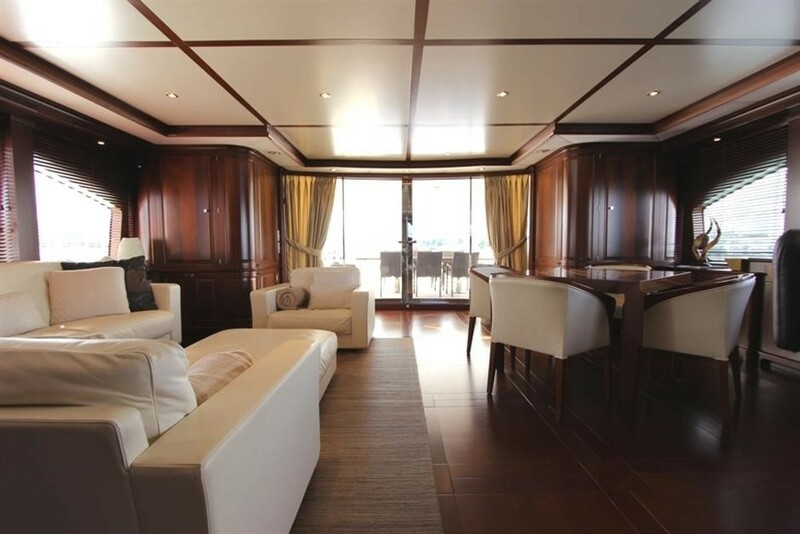 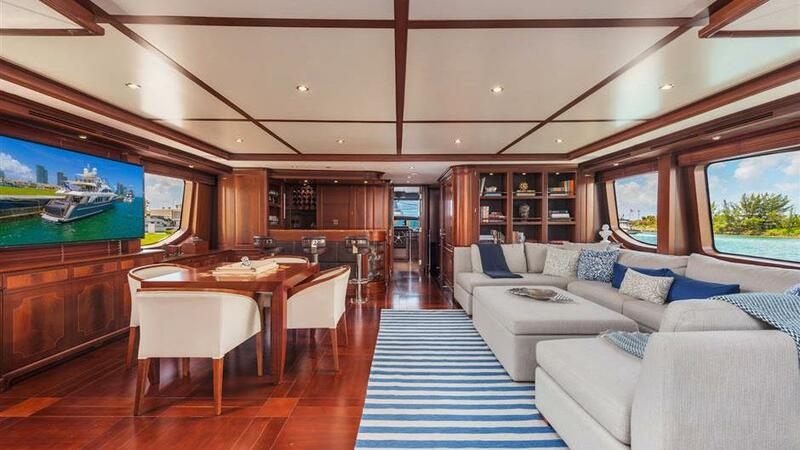 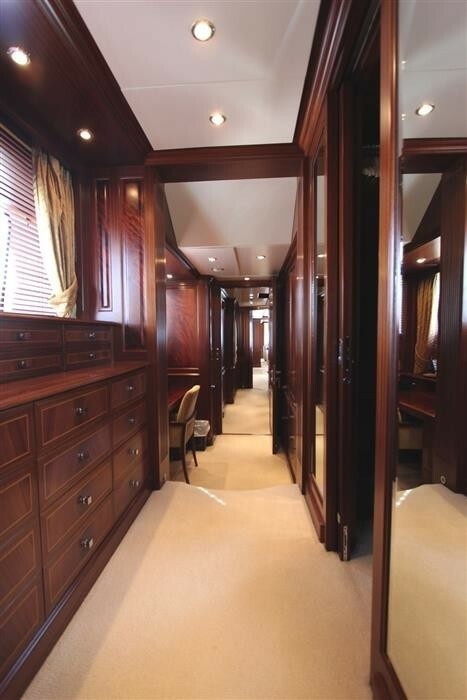 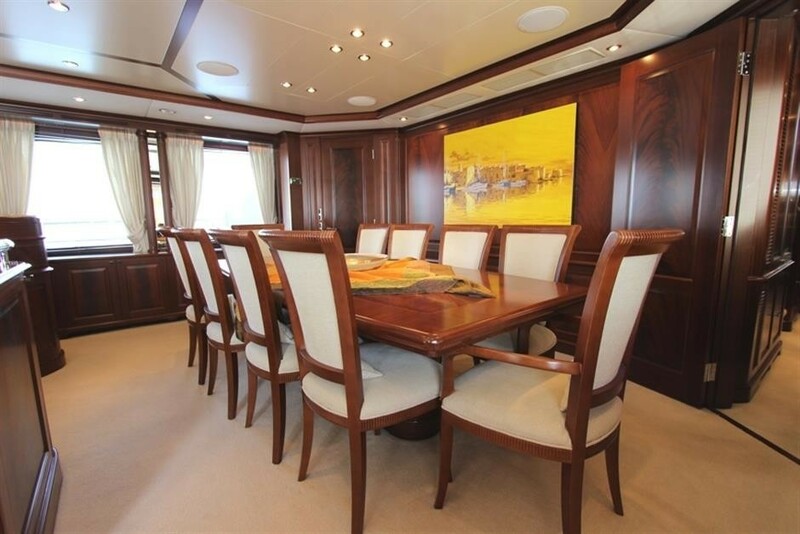 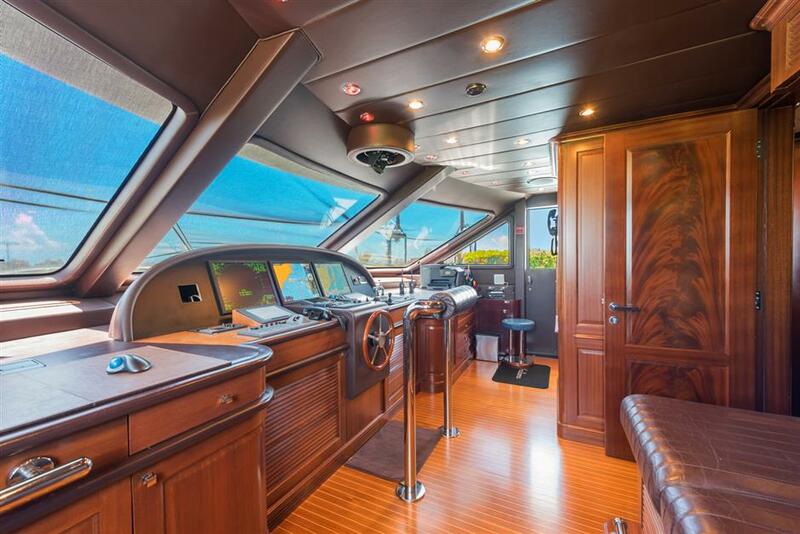 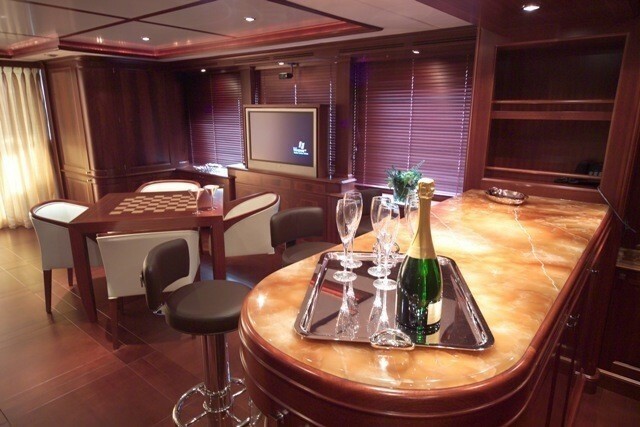 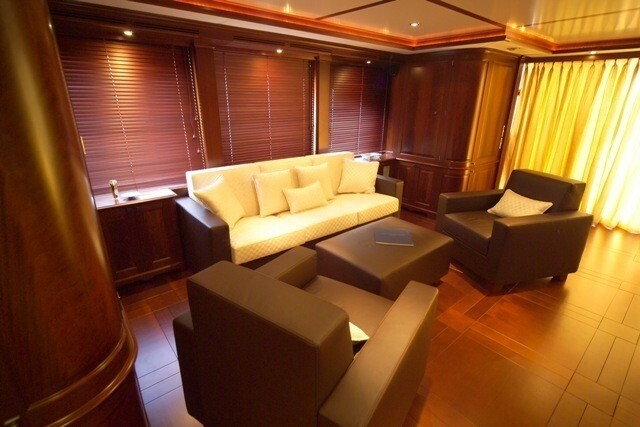 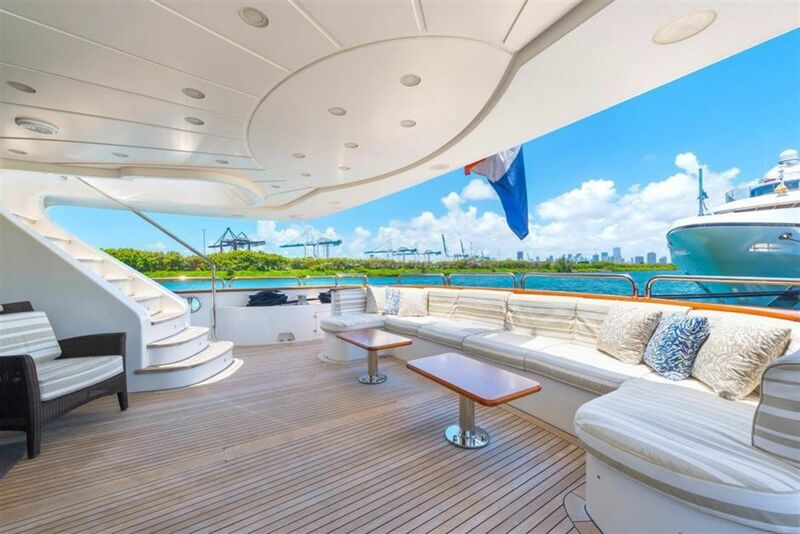 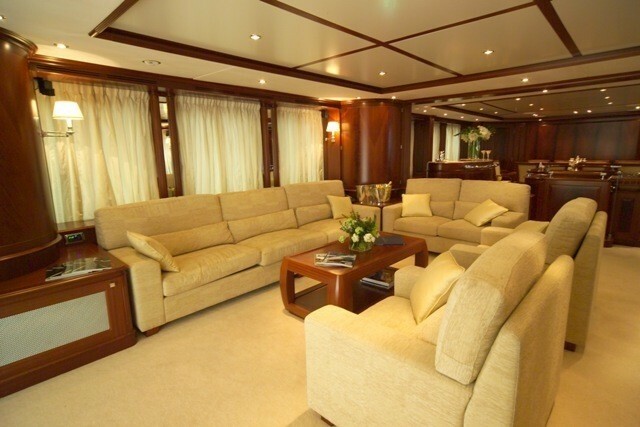 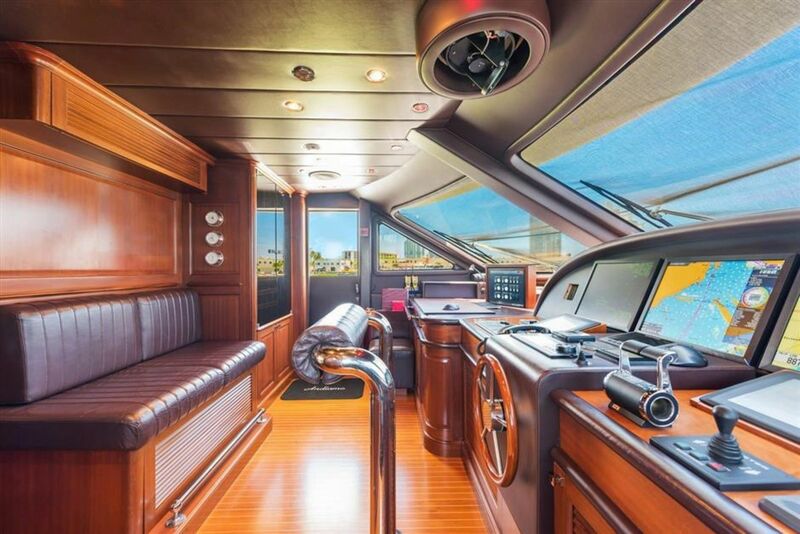 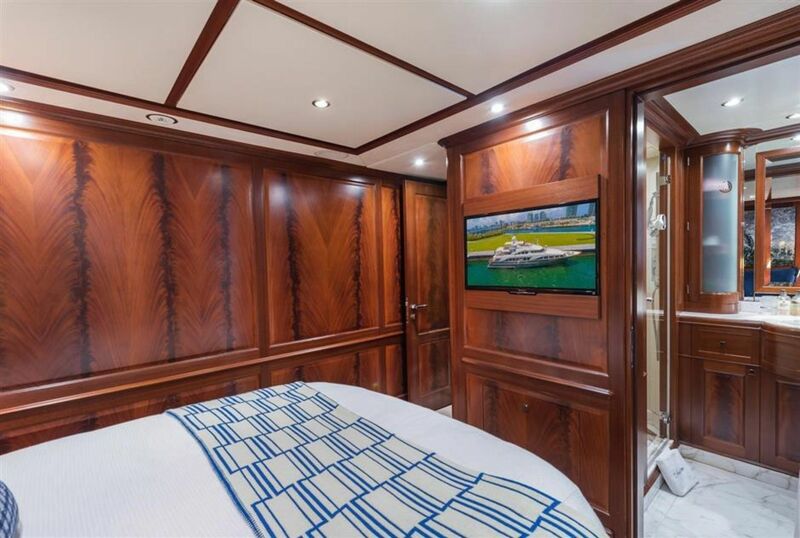 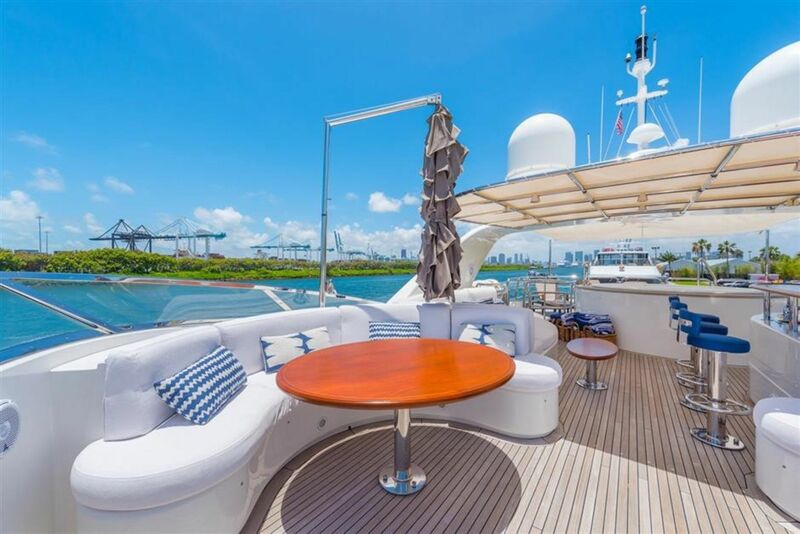 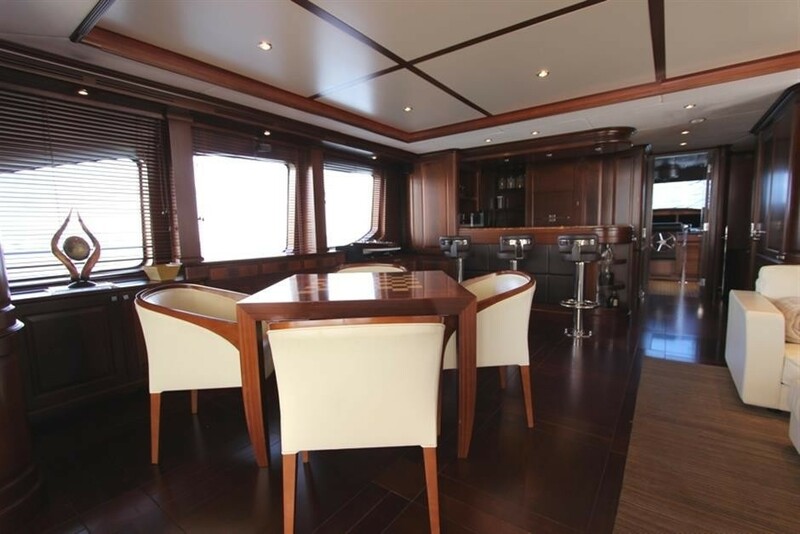 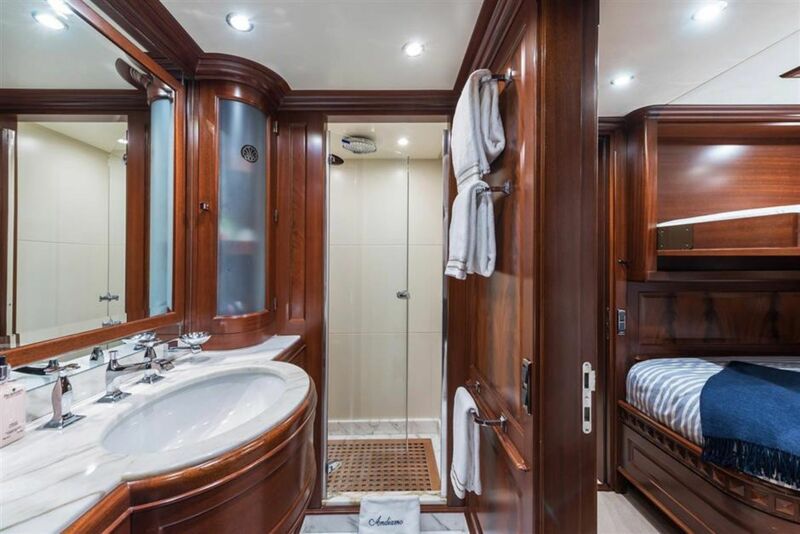 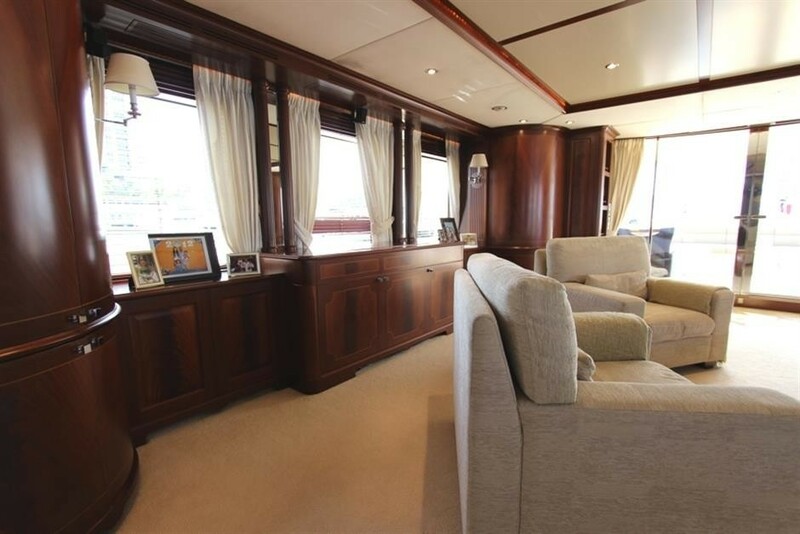 This lovely yacht has an elegant salon that is relaxing and cosy featuring a refined selection of sofas, armchairs, gold curtains and mirror inserts. 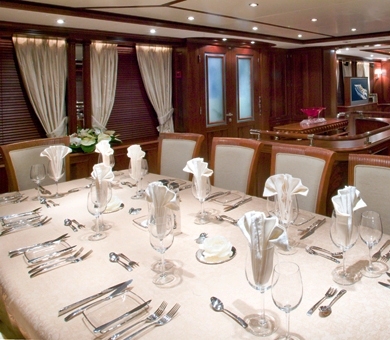 The dining area forward is intimate with a large table able to seat 10 guests for gourmet meals. 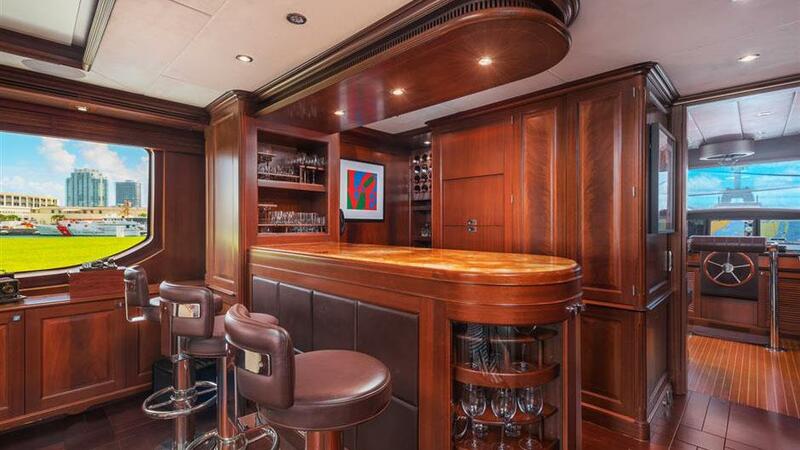 Between the salon and dining area is a bar facing a traditional stairway leading to the guest accommodation below. 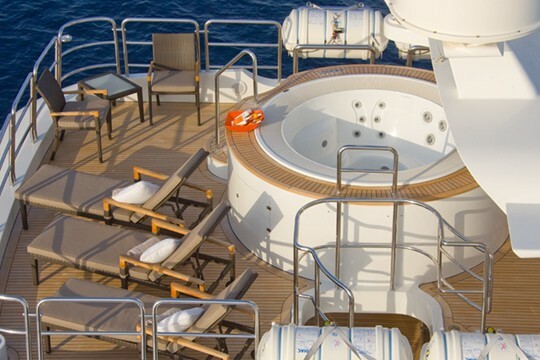 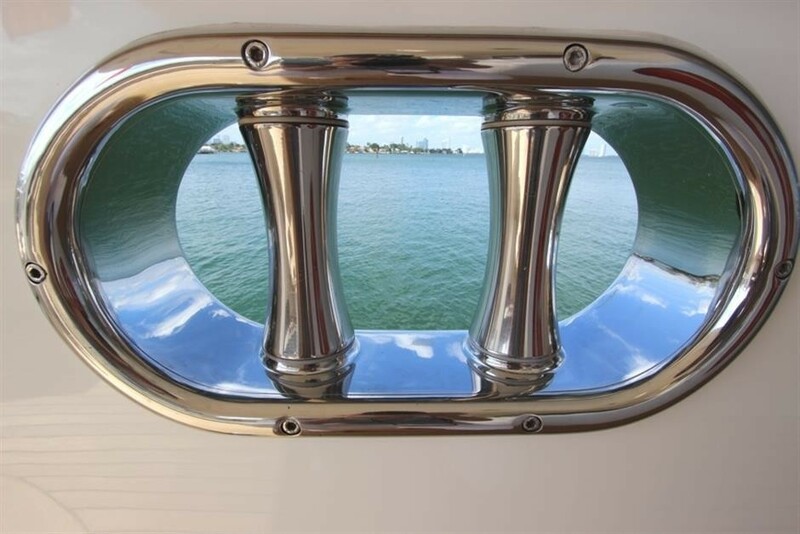 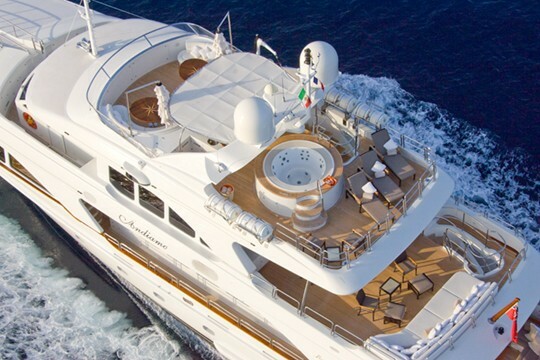 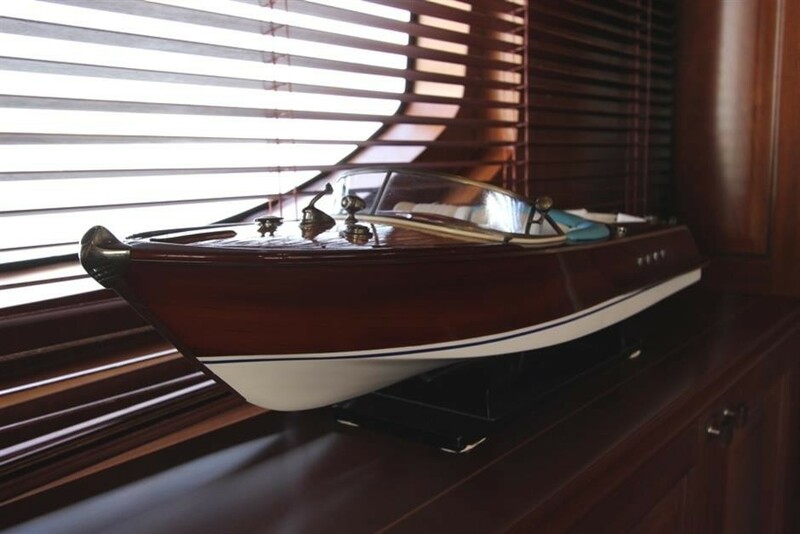 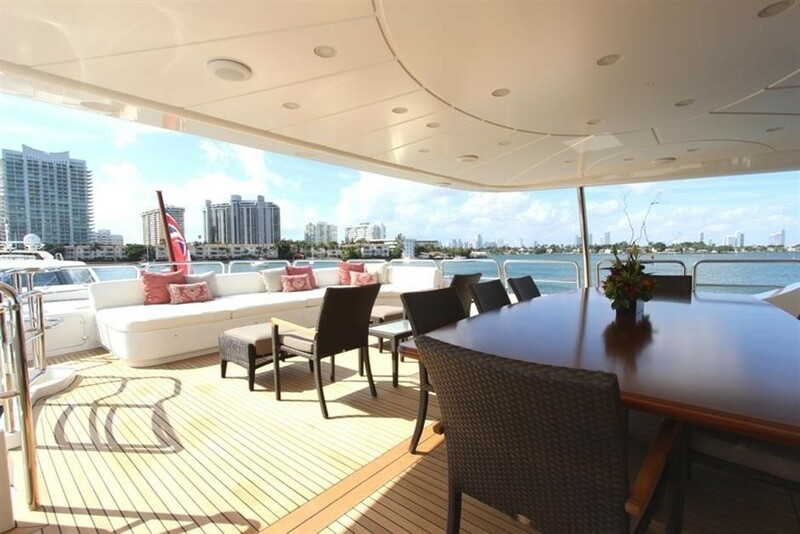 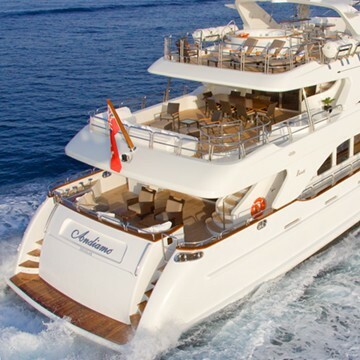 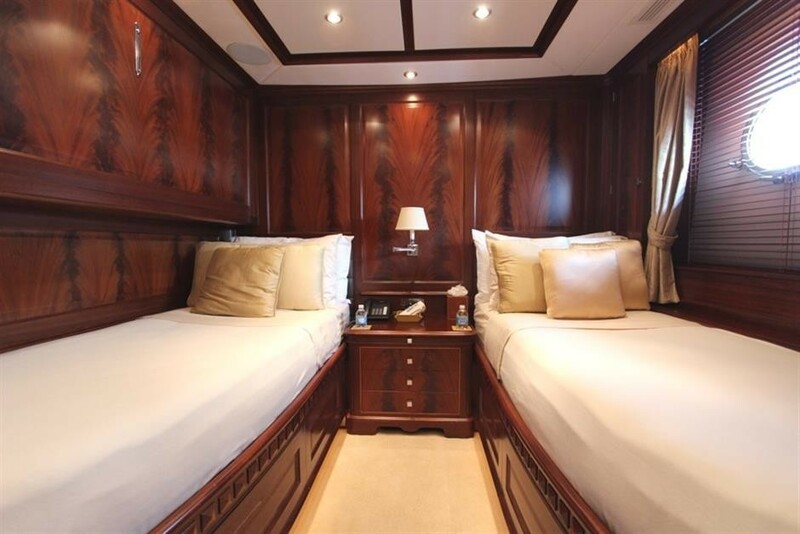 ANDIAMO can accommodate up to 10 guests in 5 cabins. 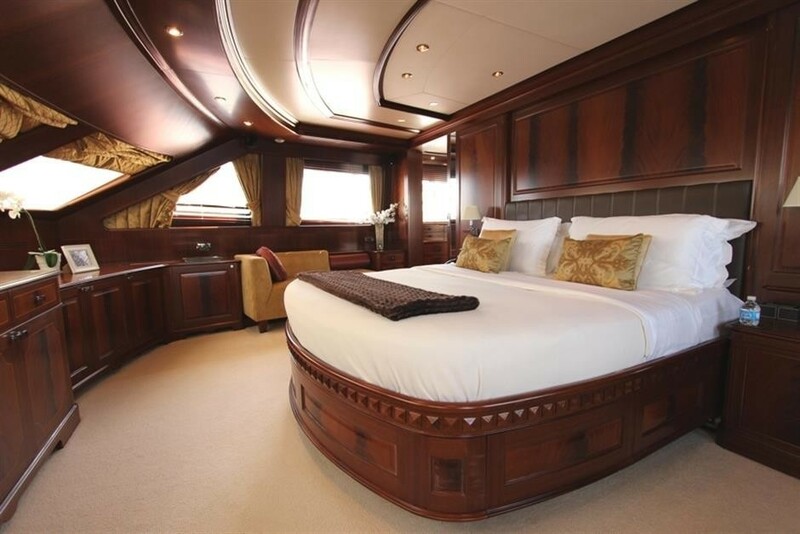 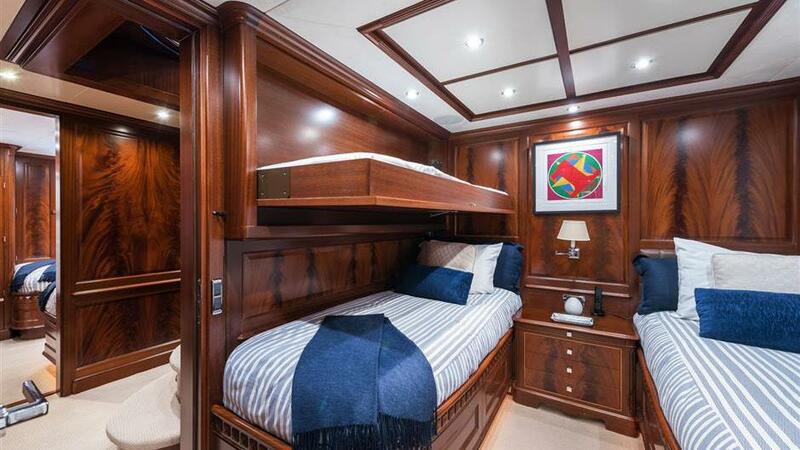 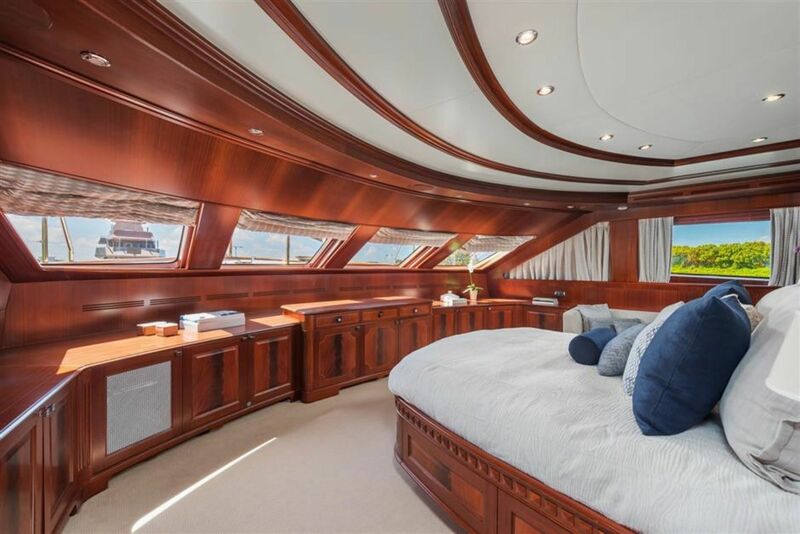 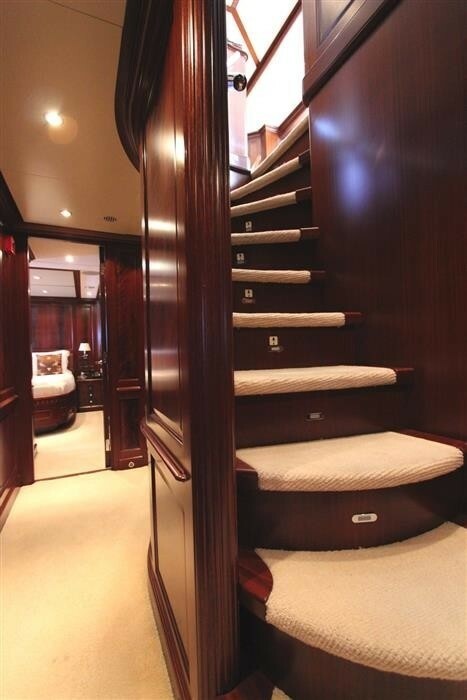 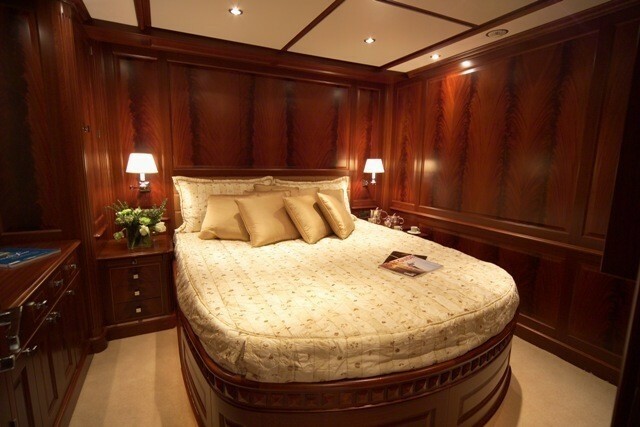 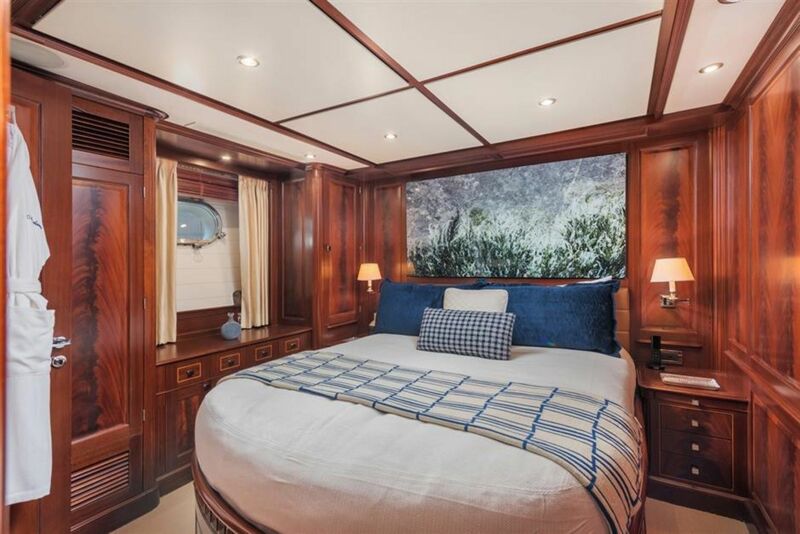 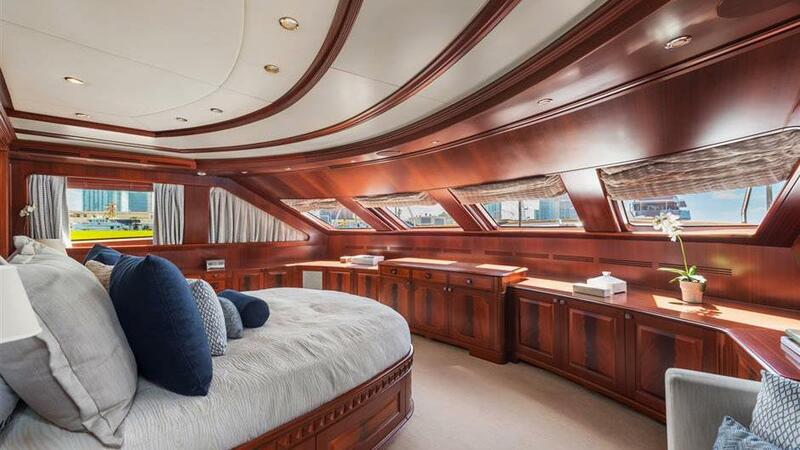 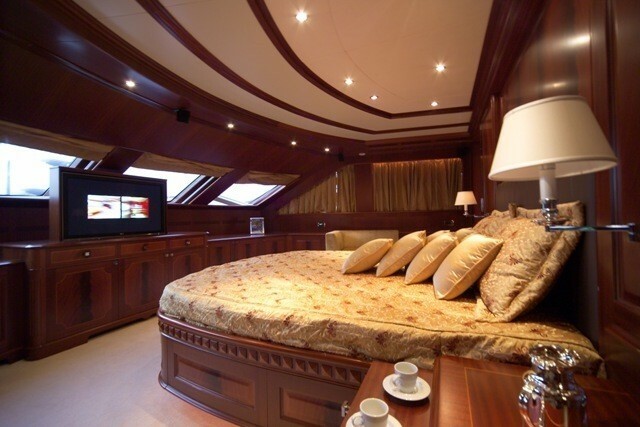 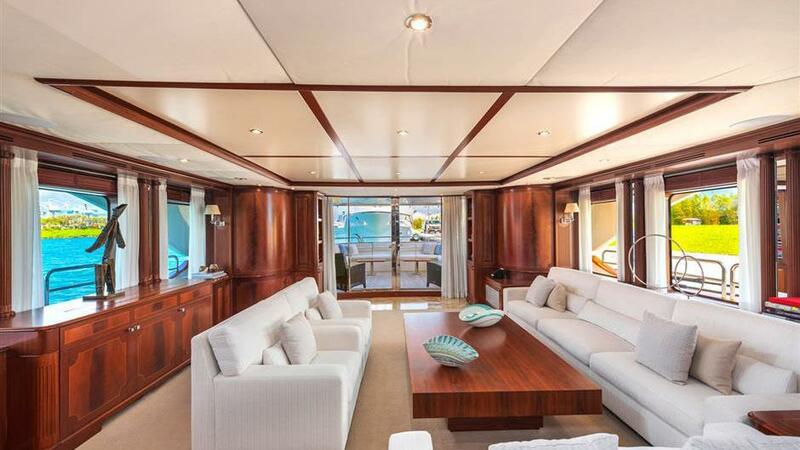 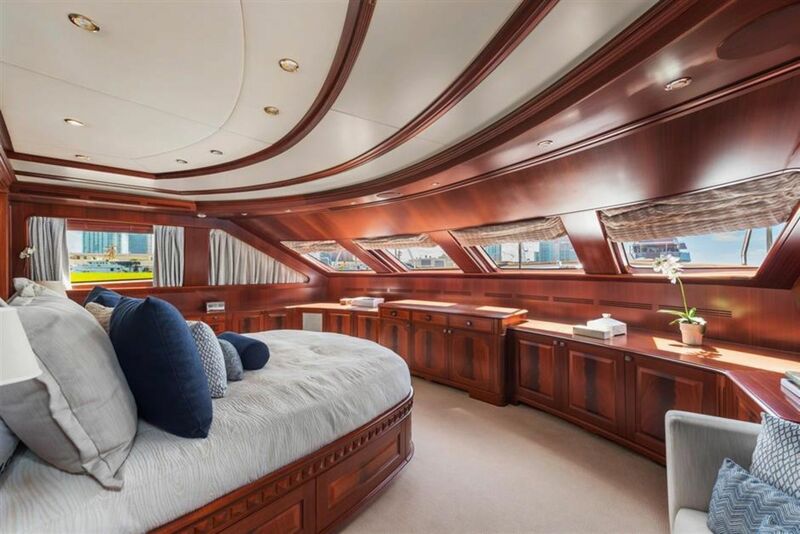 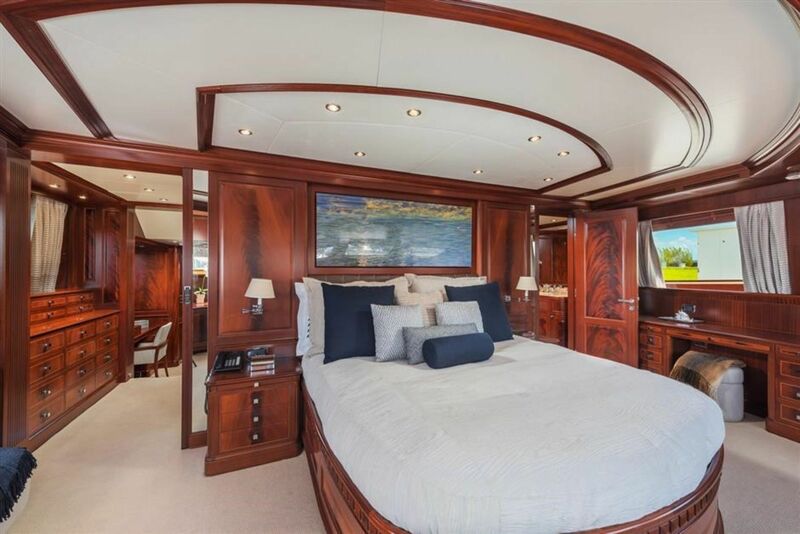 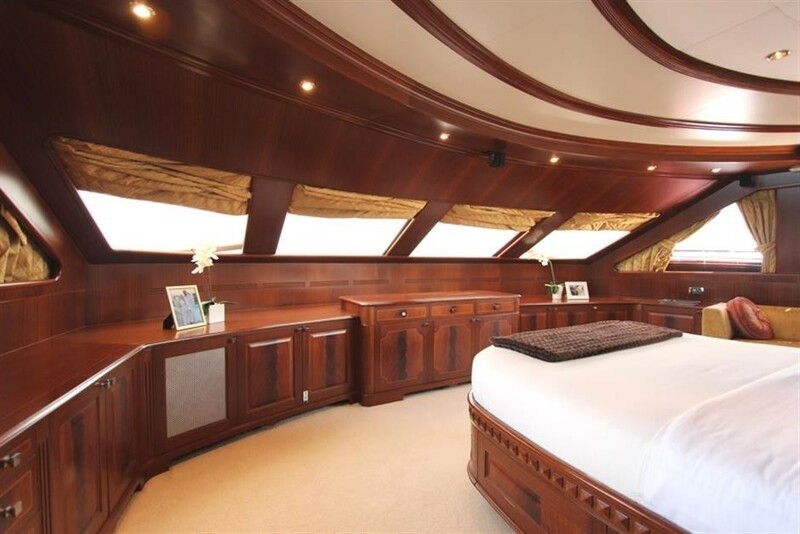 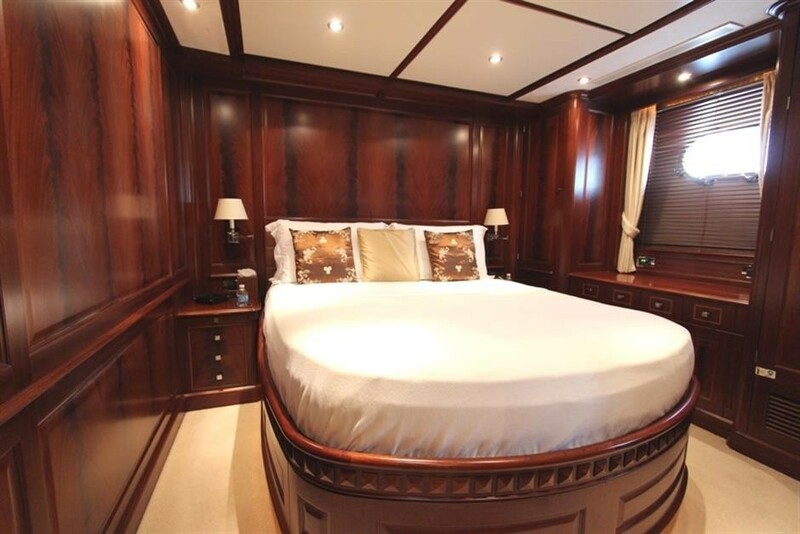 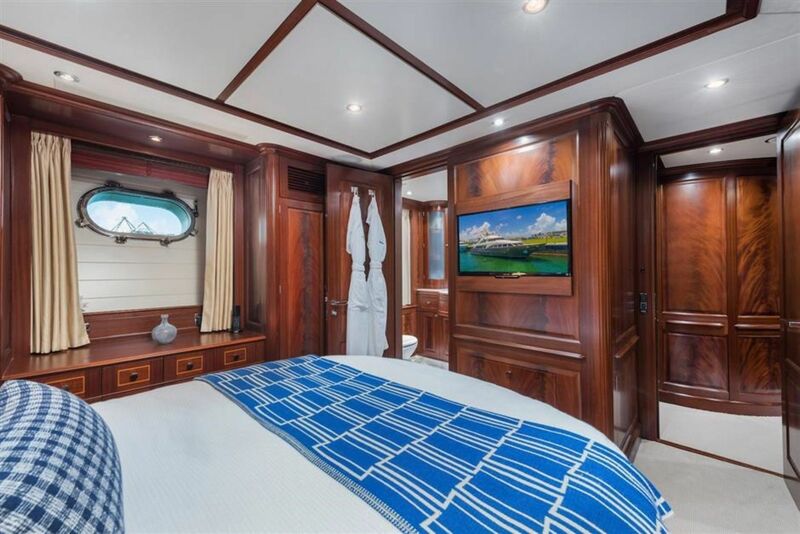 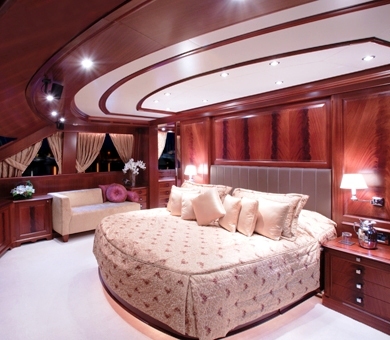 Her full beam master cabin features a king-sized bed and boasts 180° panoramic views surrounded by the lavish decor. 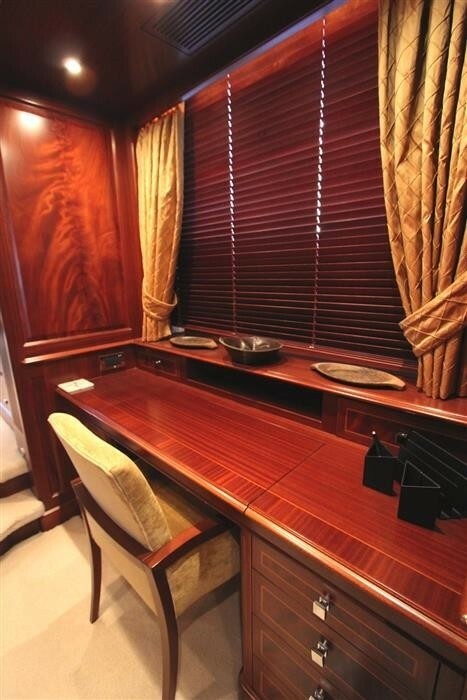 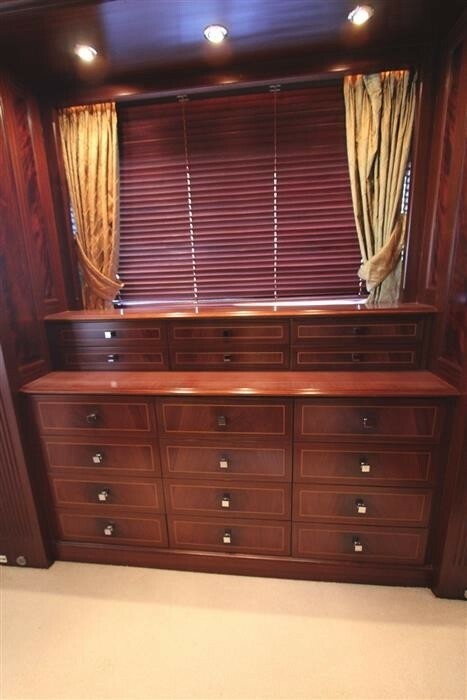 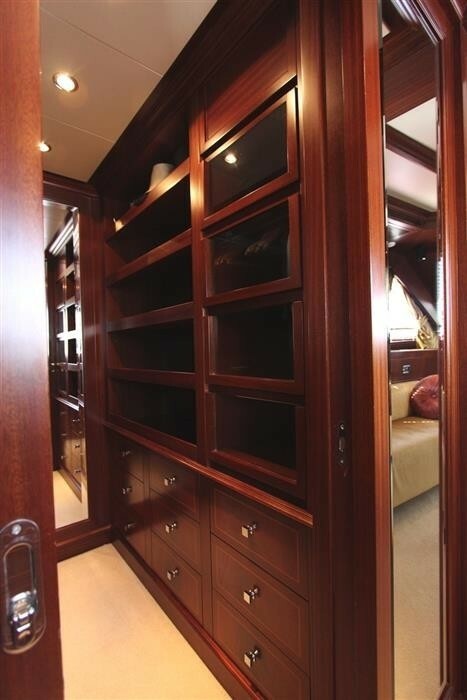 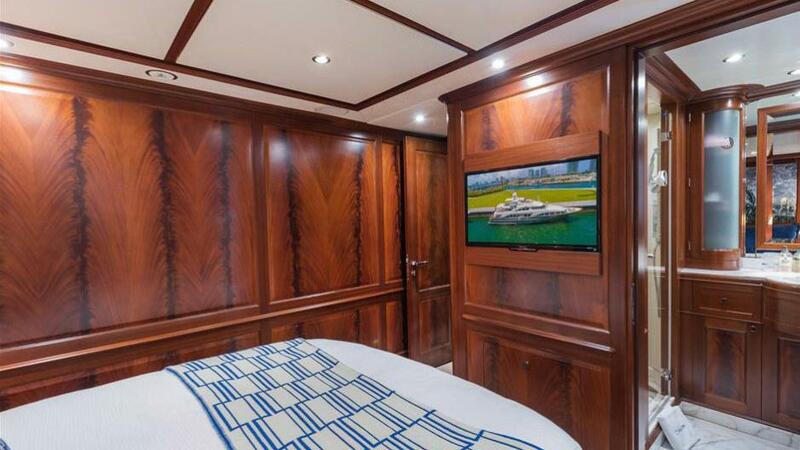 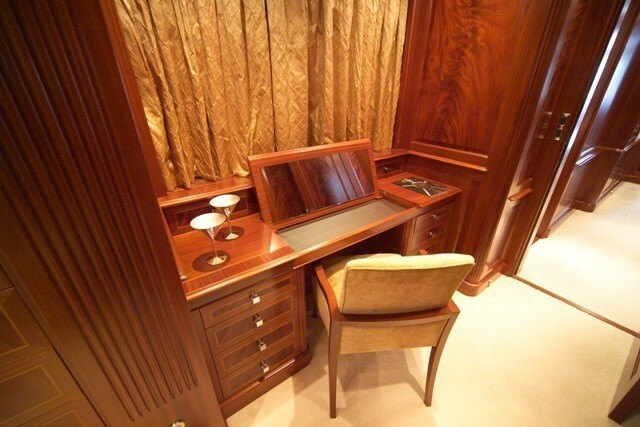 The Master cabin also features a study, a walk-in wardrobe, a large plasma screen and a dark velvet chaise-longue. 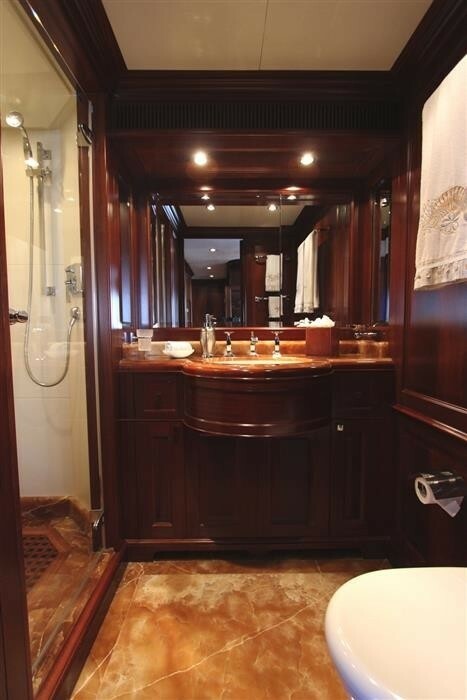 The ensuite bathroom is decorated in warm honey coloured onyx with dark wooden finishings. 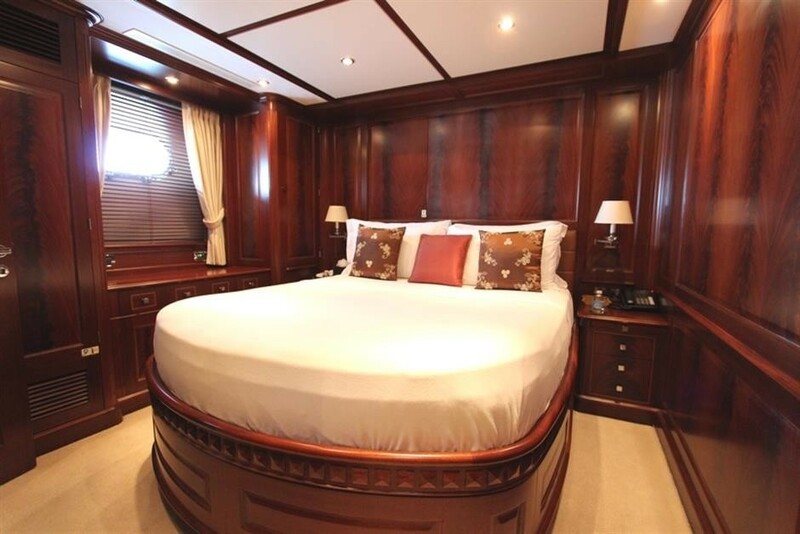 The remaining cabins are located on the lower deck and include a VIP cabin decorated in warm mahogany and soft cream furnishings with a large double bed and en-suite bathroom. 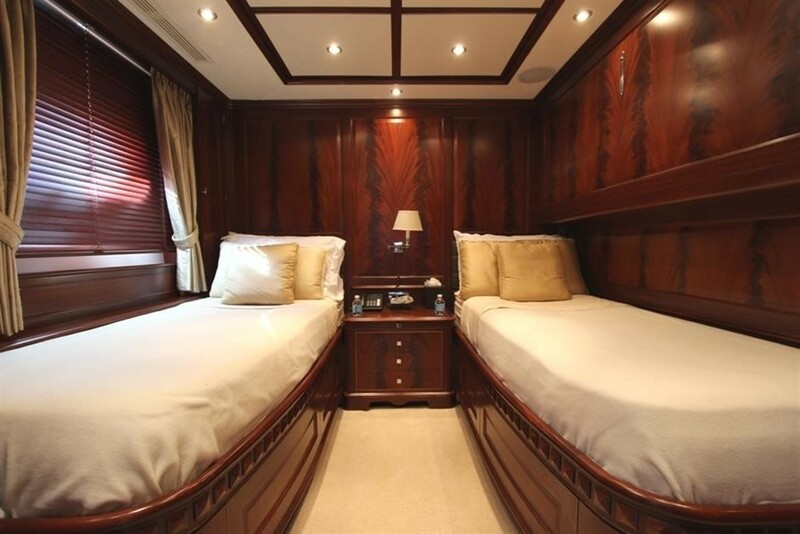 A double cabin and two twin cabins with Pullman beds are also situated below. 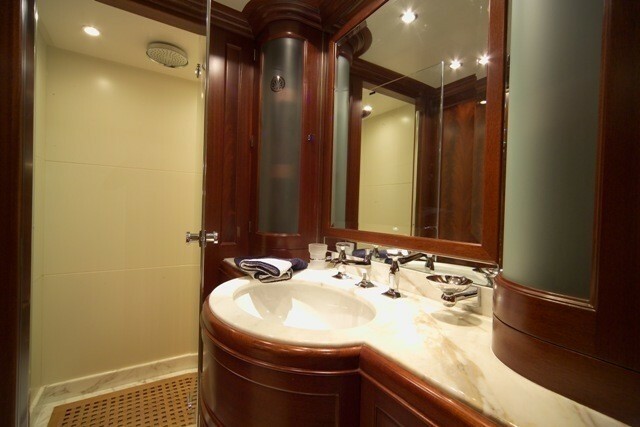 The unique and refined Zuretti bathrooms are furnished with Zucchetti taps and fittings. 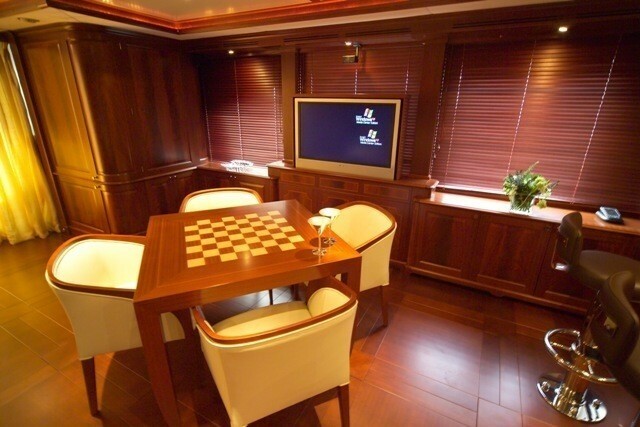 The sky lounge is inviting with an onyx-top and leather finished bar, comfortable Frau Sofas, a games table with a carved wooden chess board and a retractable plasma TV. 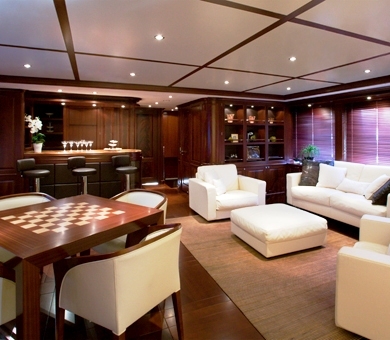 The room creates an informal yet distinguished atmosphere. 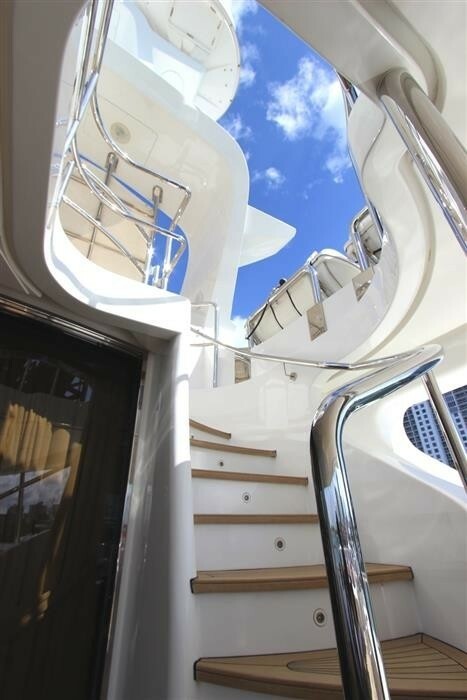 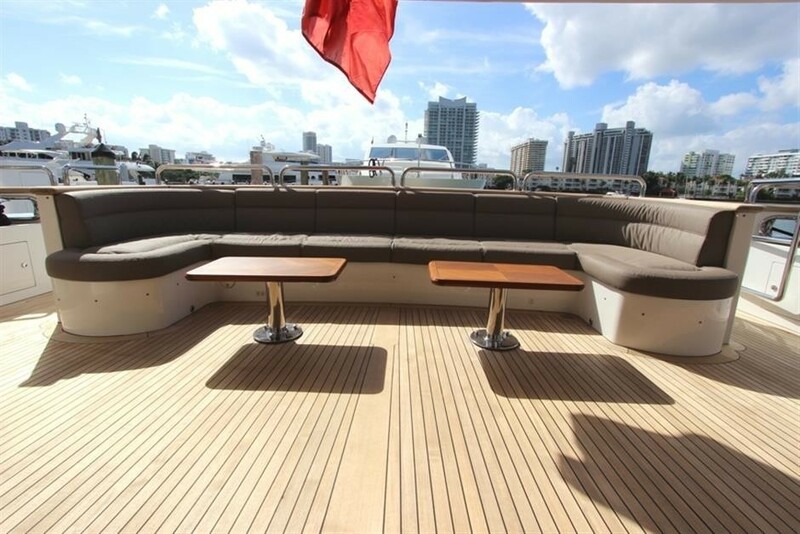 Leading from the sky lounge aft is the upper deck which is a great area to dine al fresco. 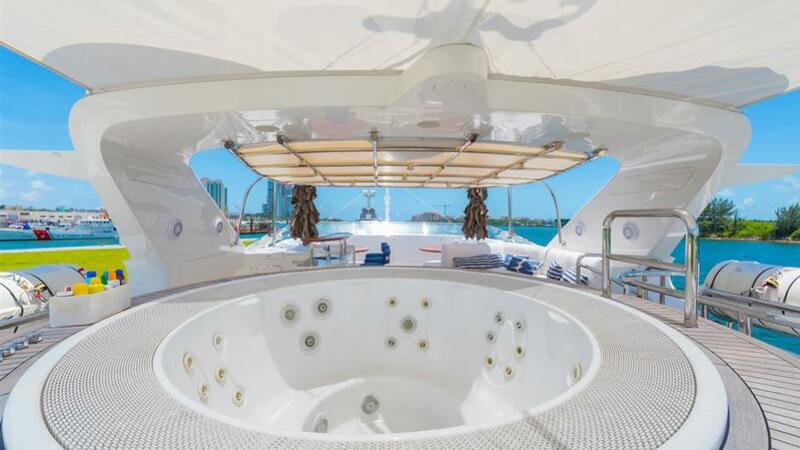 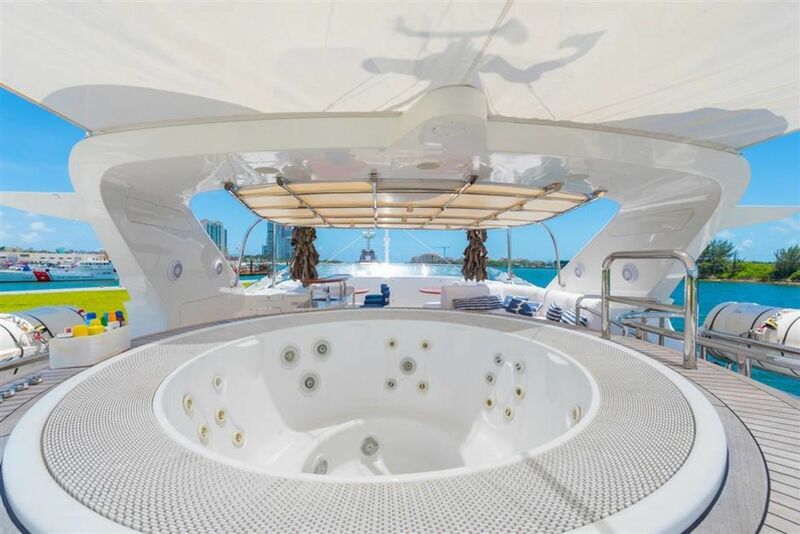 One level up is the sun deck that features a Spa Pool, lounge area, al fresco dining area, BBQ, and wet bar with seating. 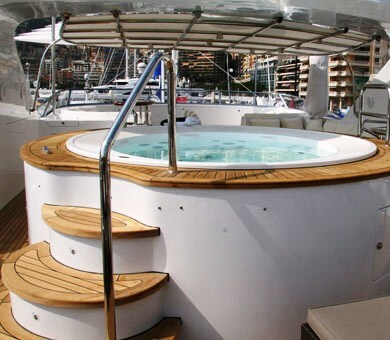 A great place to relax on a hot day or in the warm evenings. 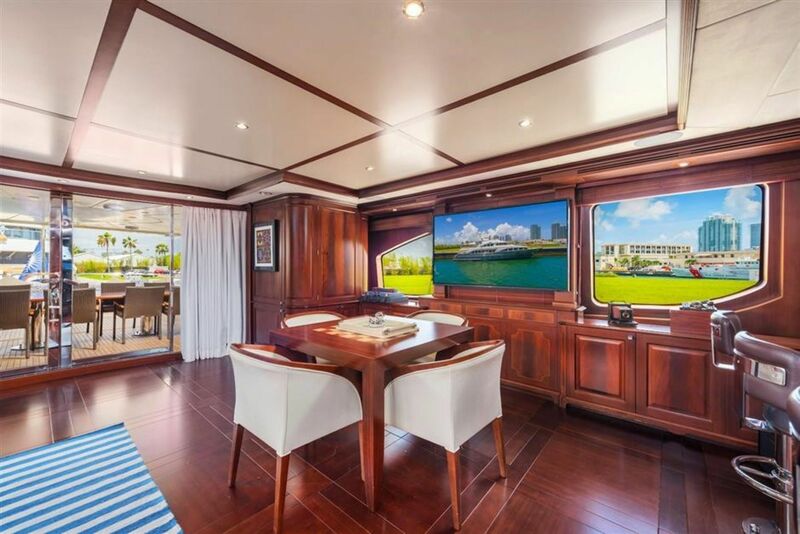 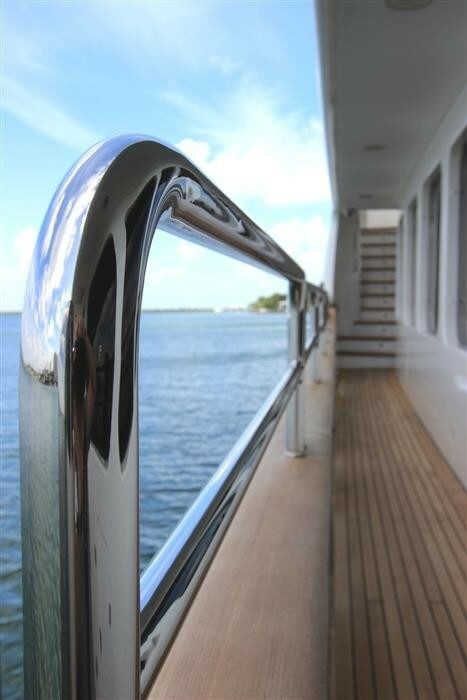 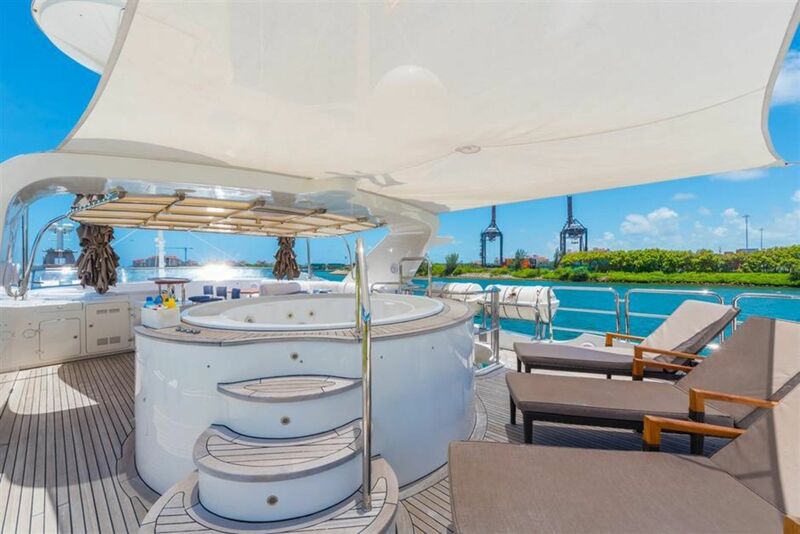 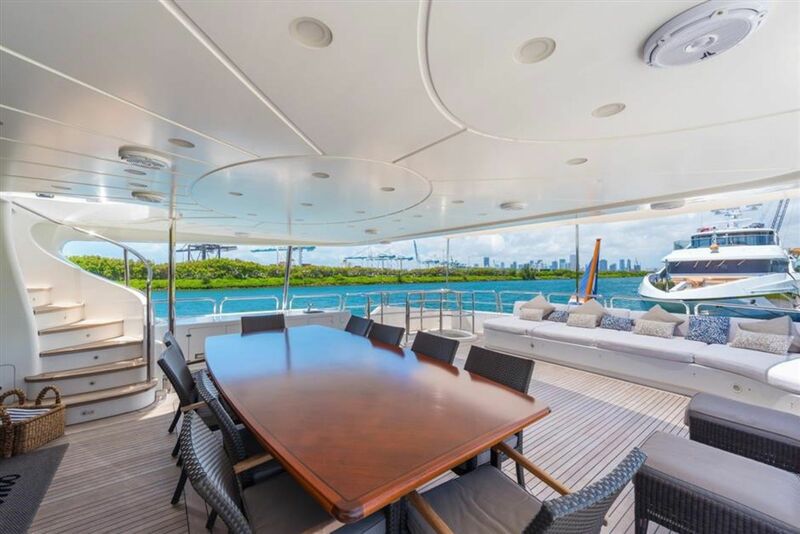 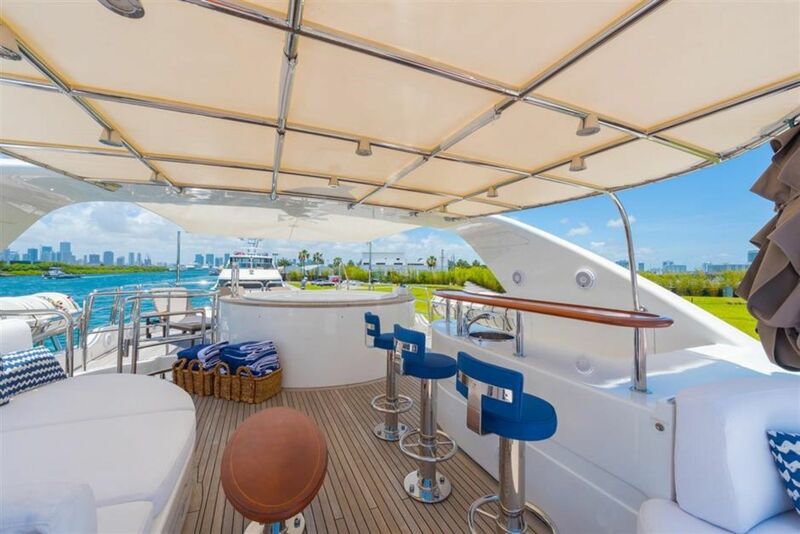 Luxury yacht ANDIAMO features the latest in audio visual entertainment systems as well as innovations such as zero speed stabilizers. 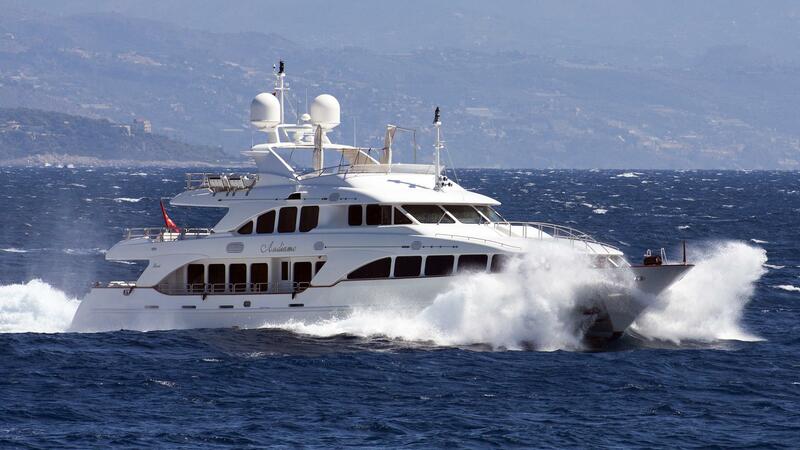 She has a great selection of water sport toys and a professional crew of 7. 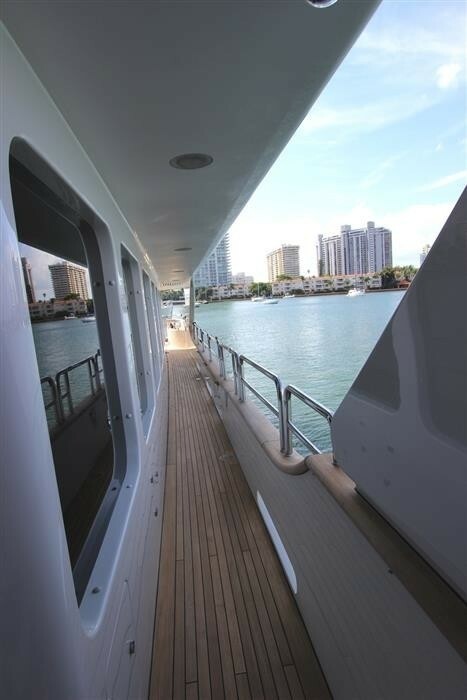 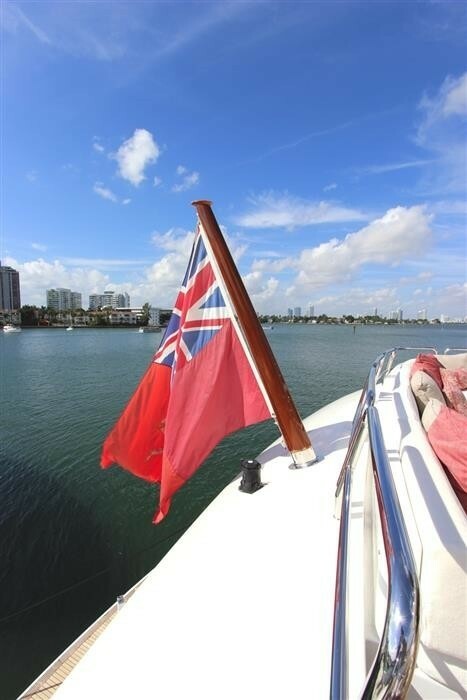 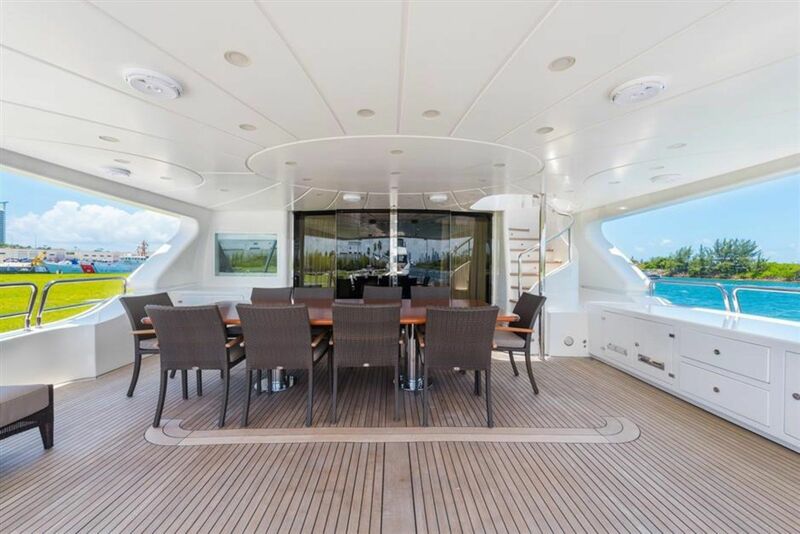 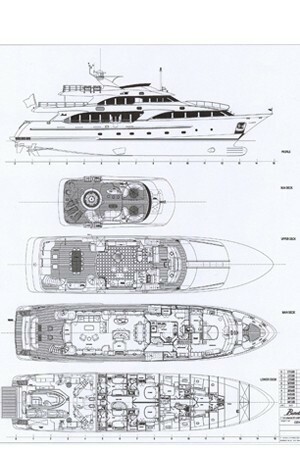 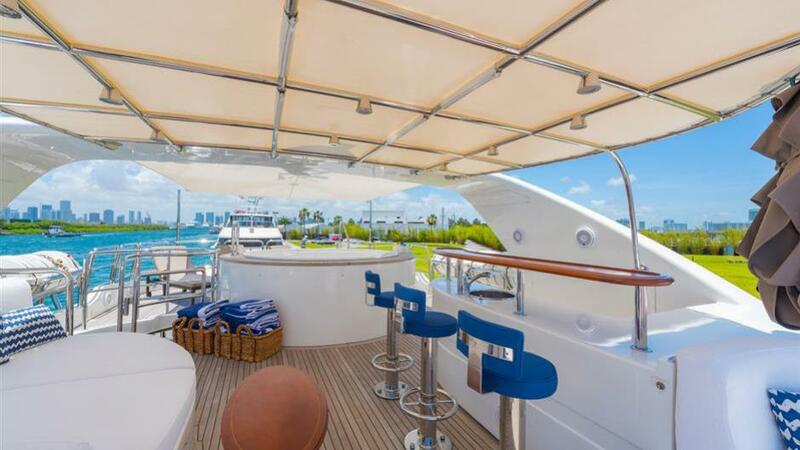 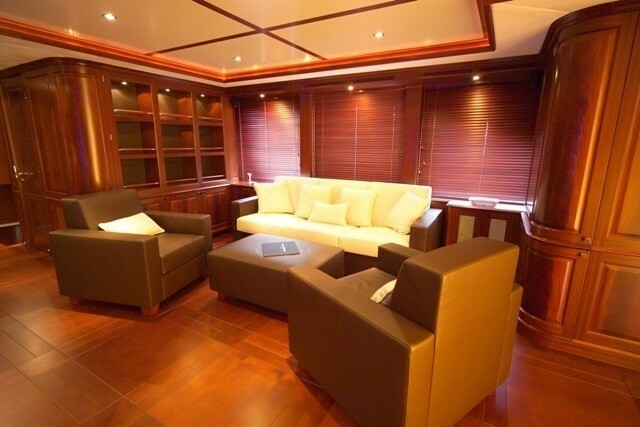 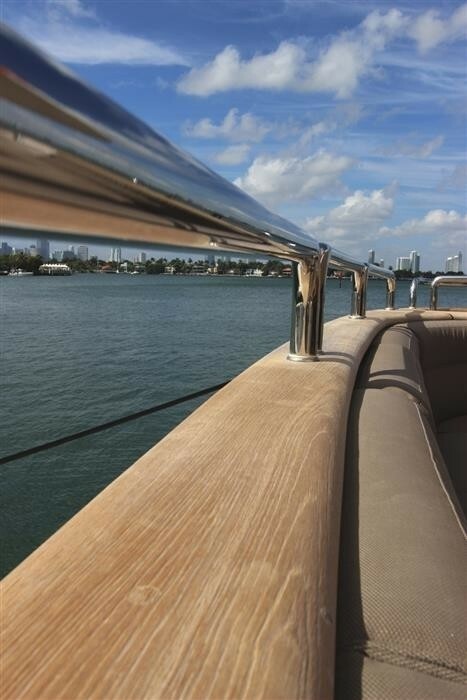 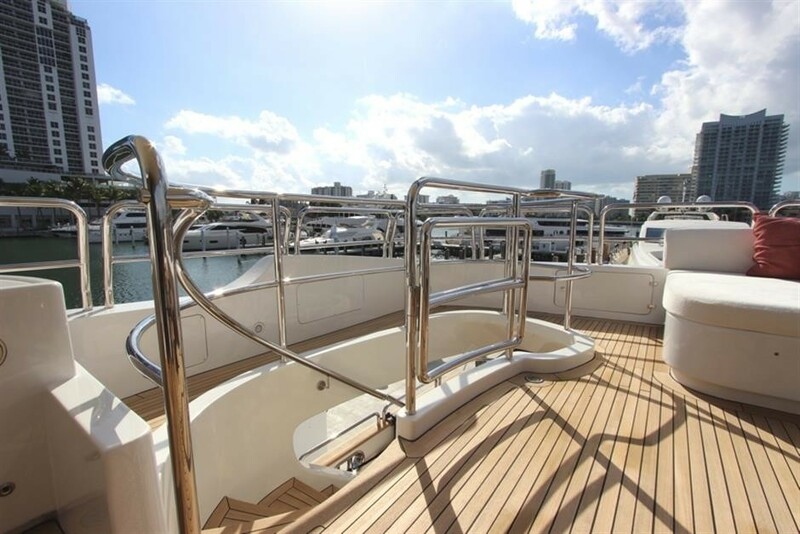 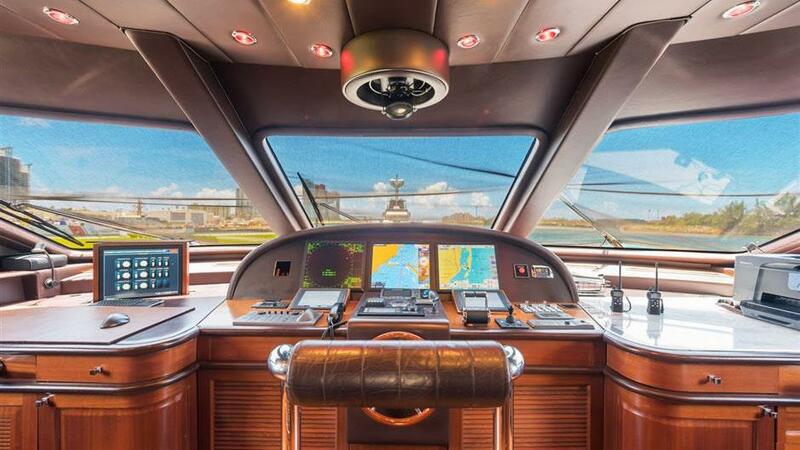 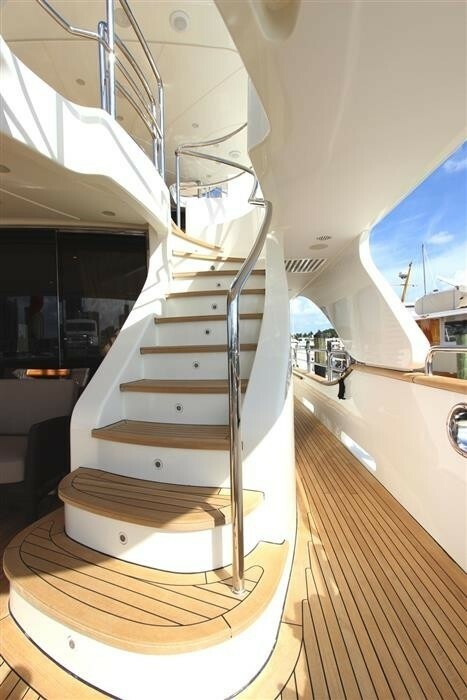 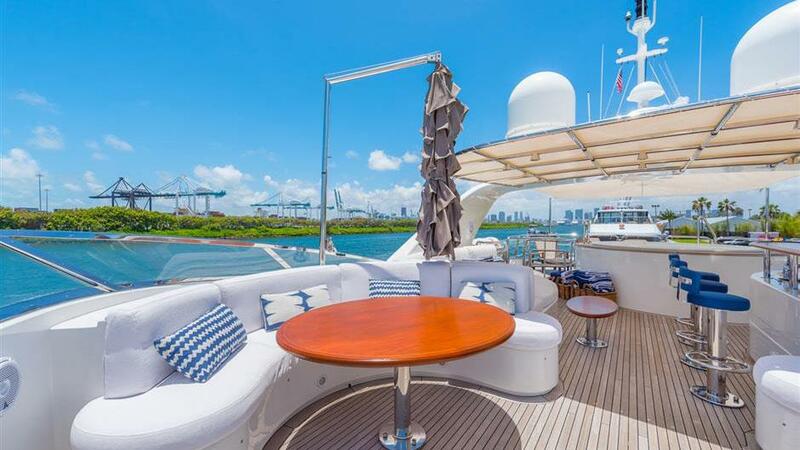 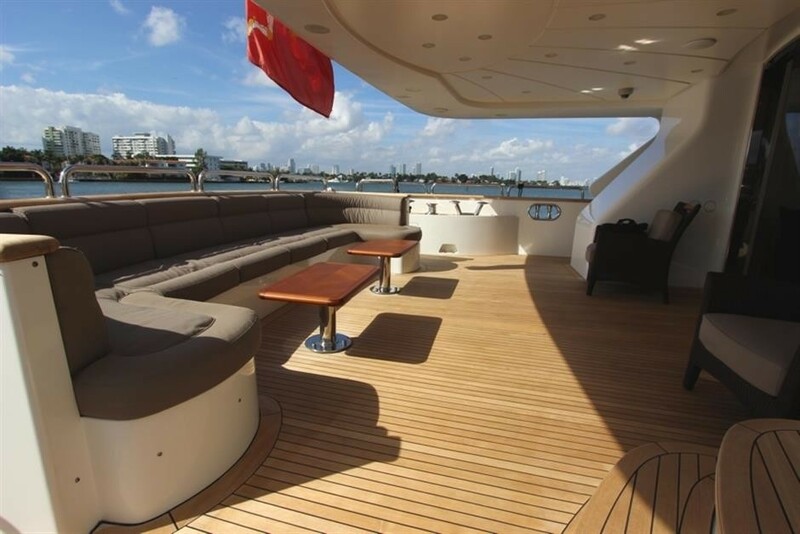 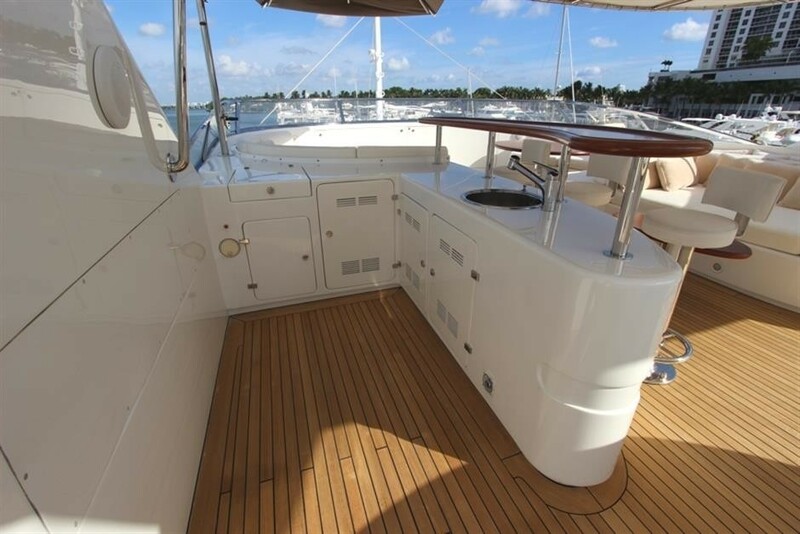 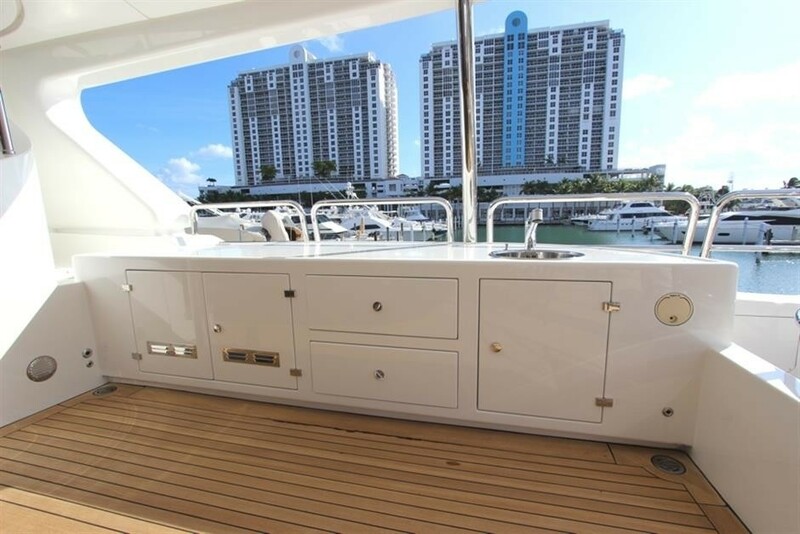 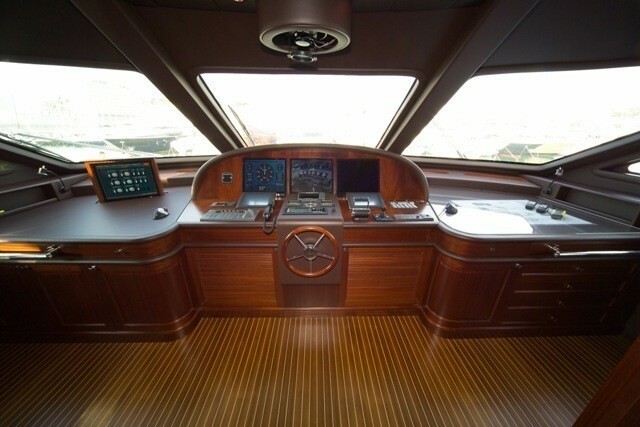 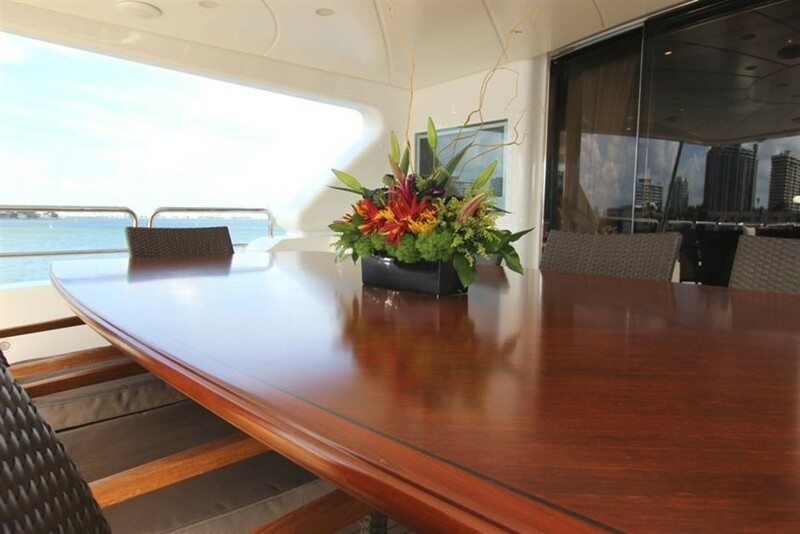 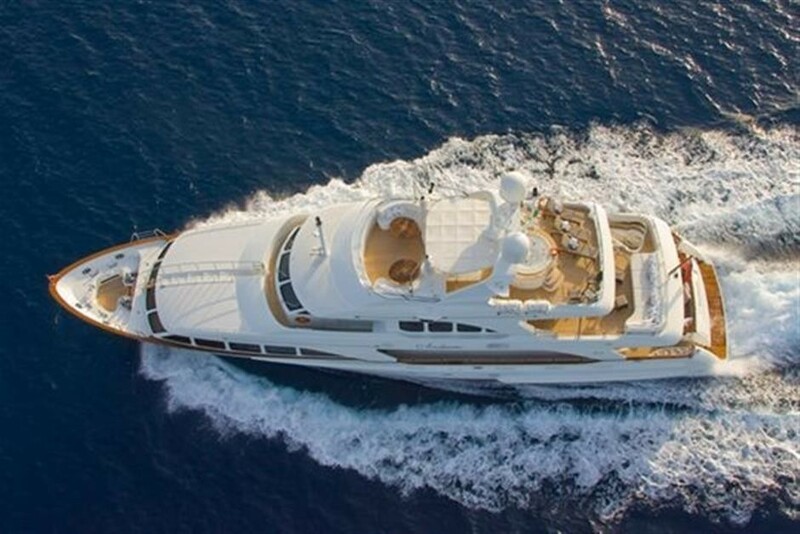 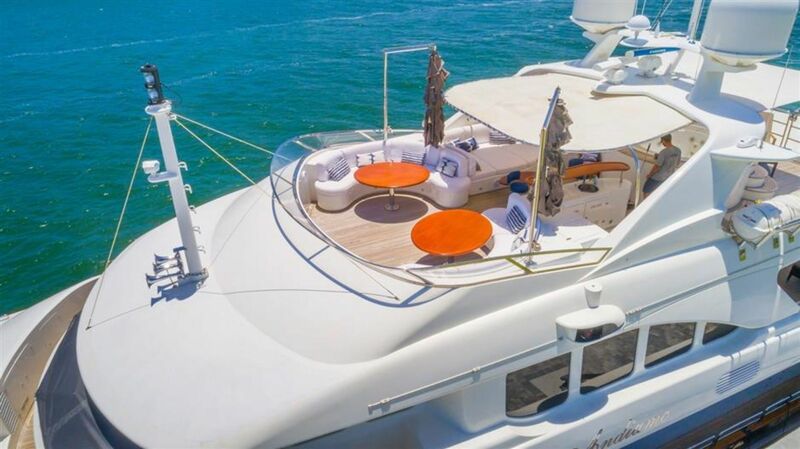 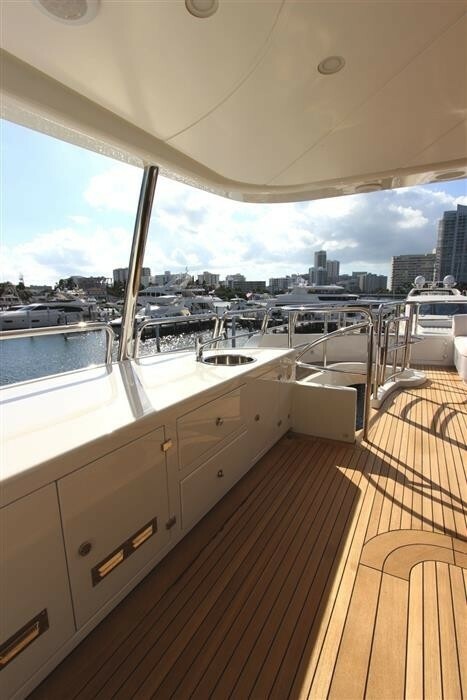 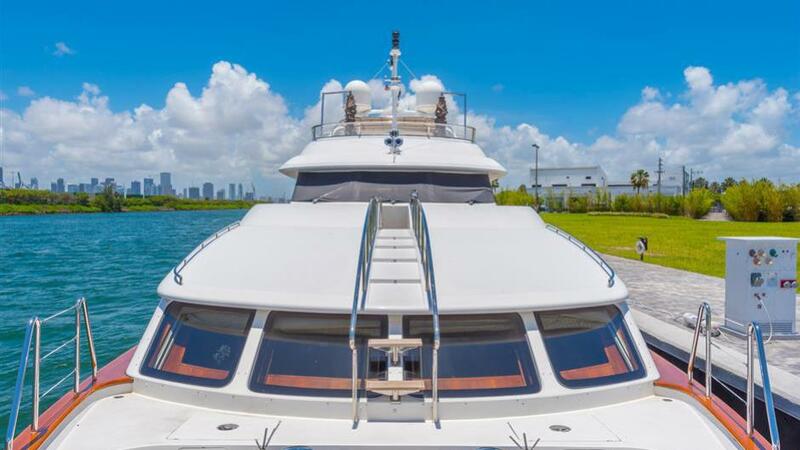 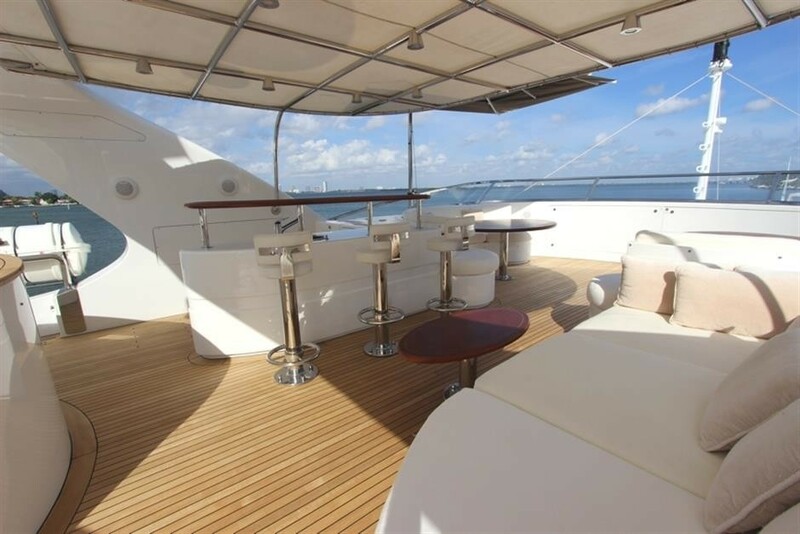 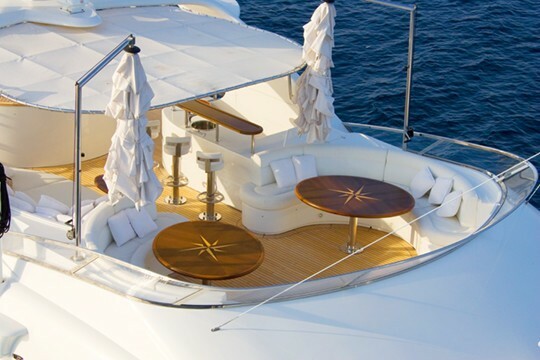 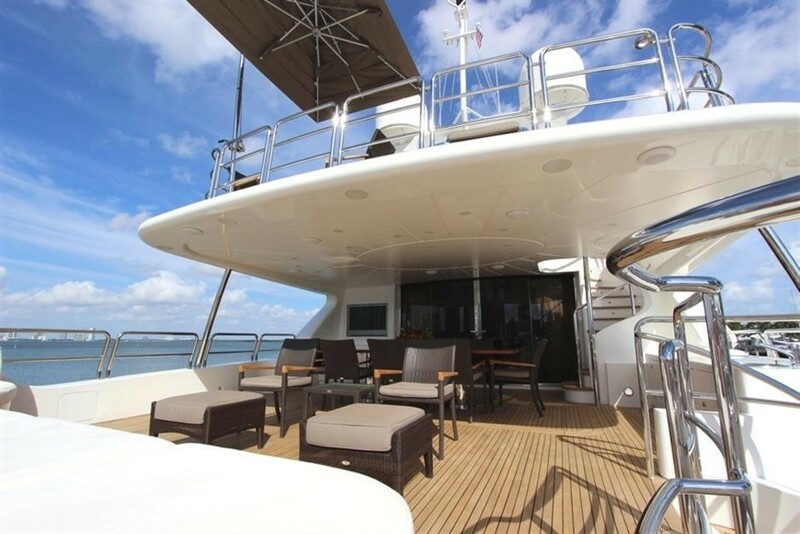 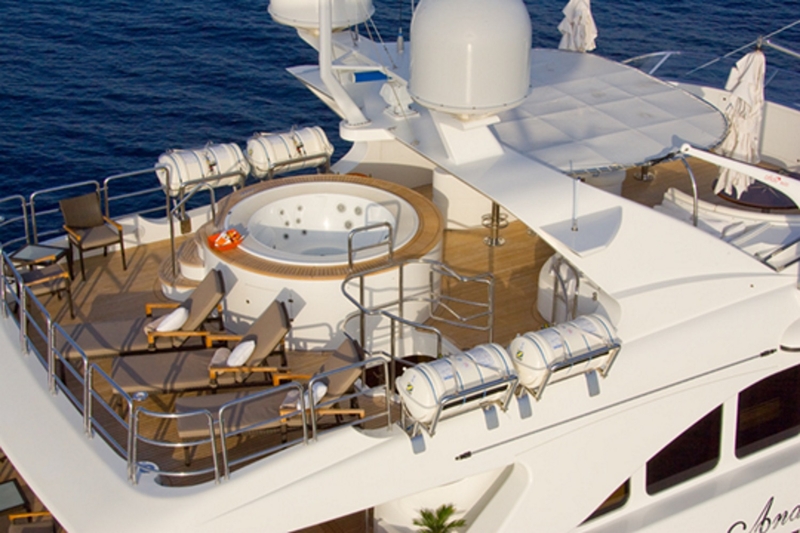 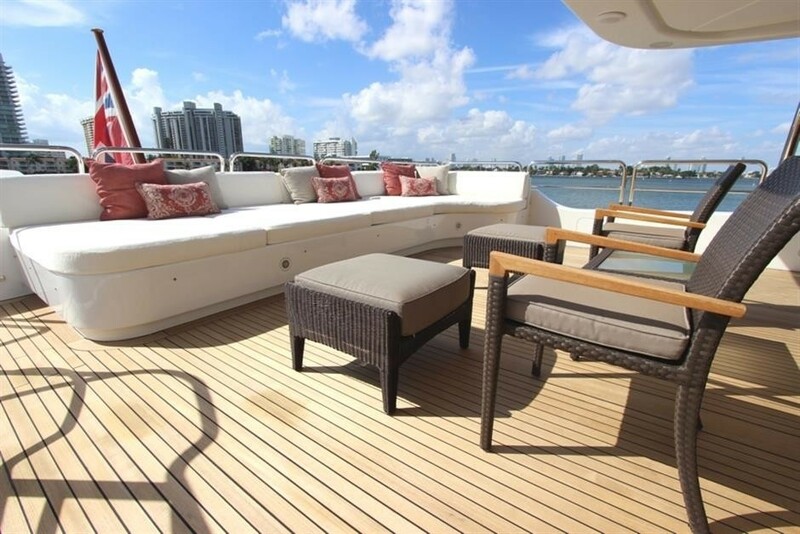 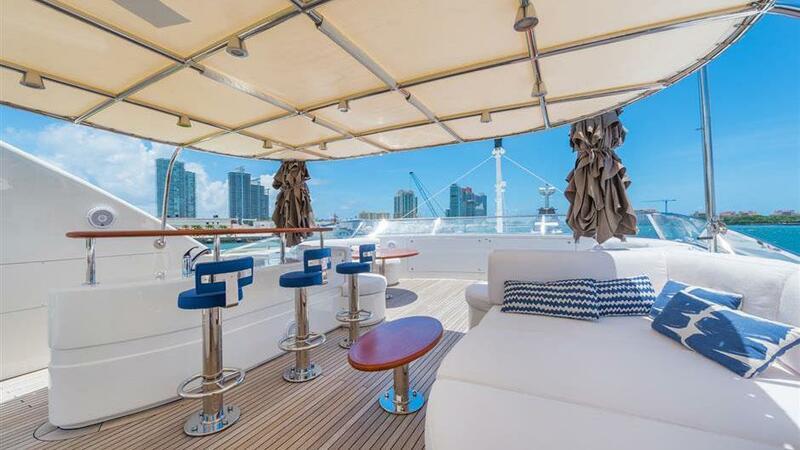 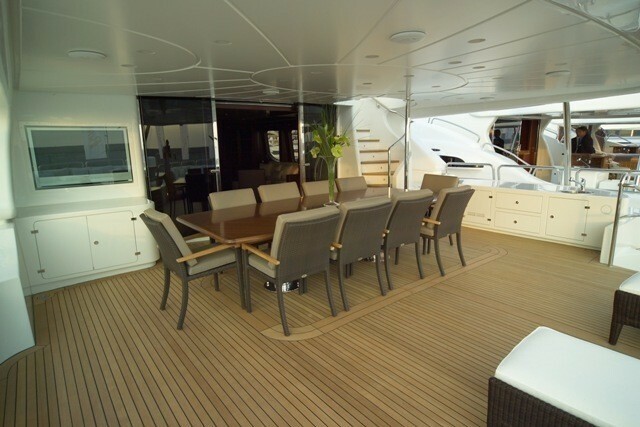 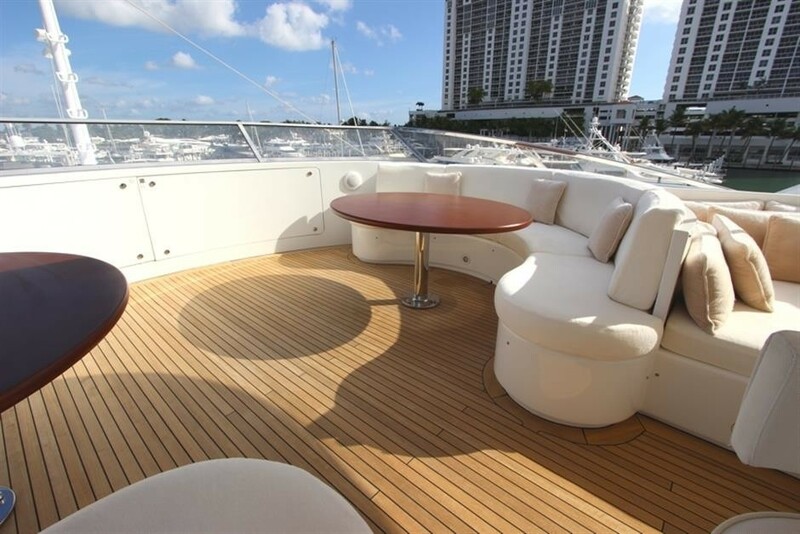 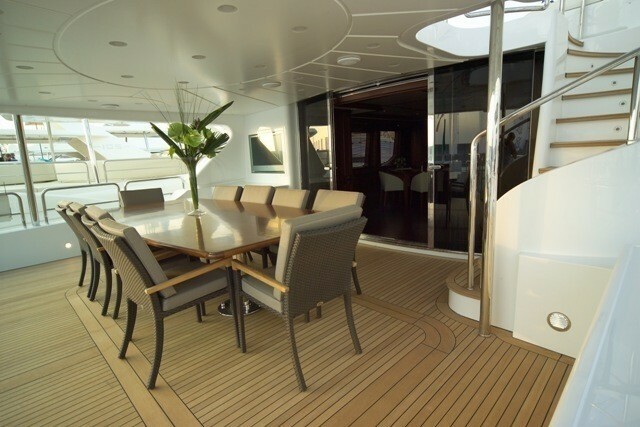 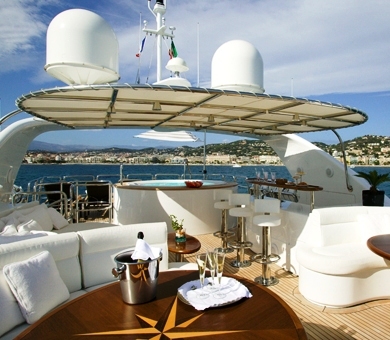 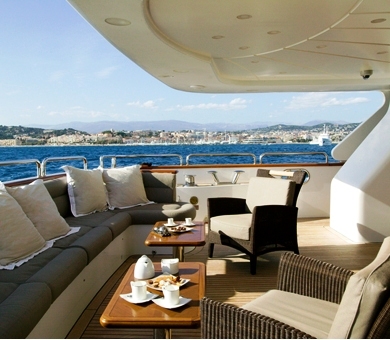 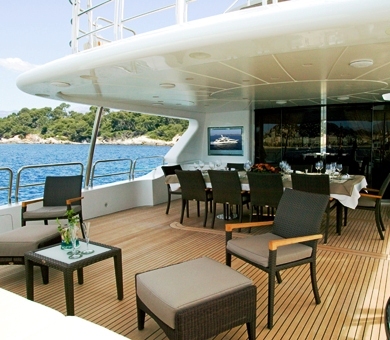 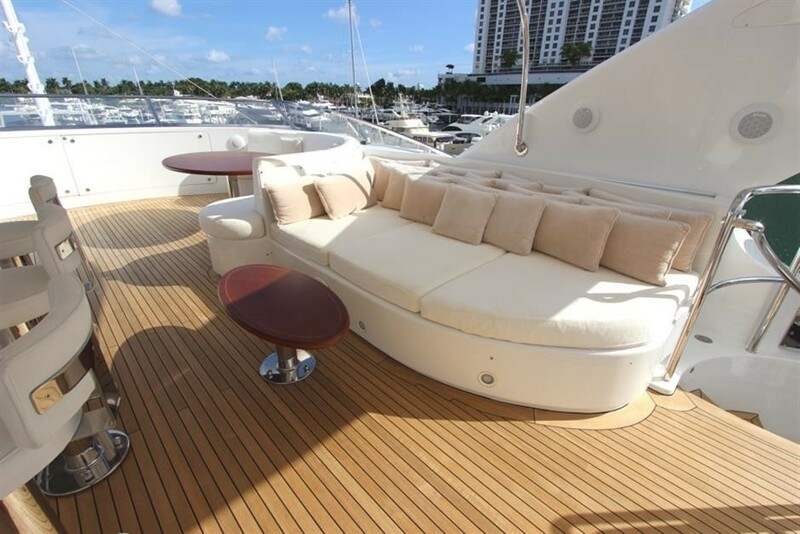 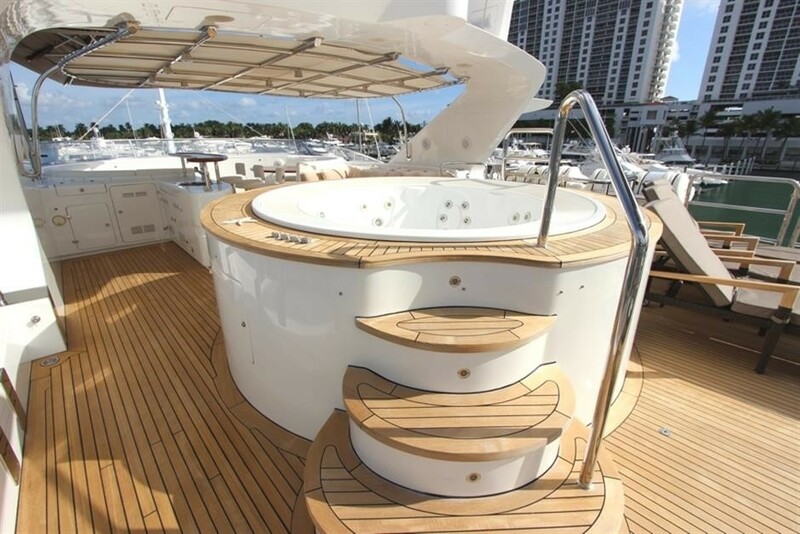 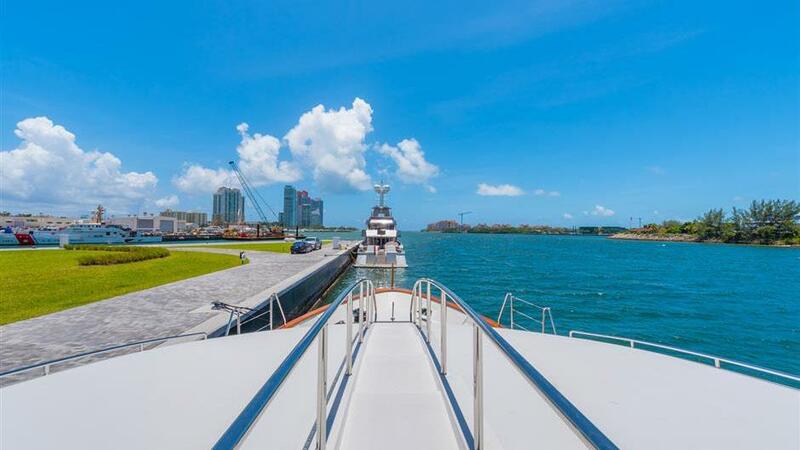 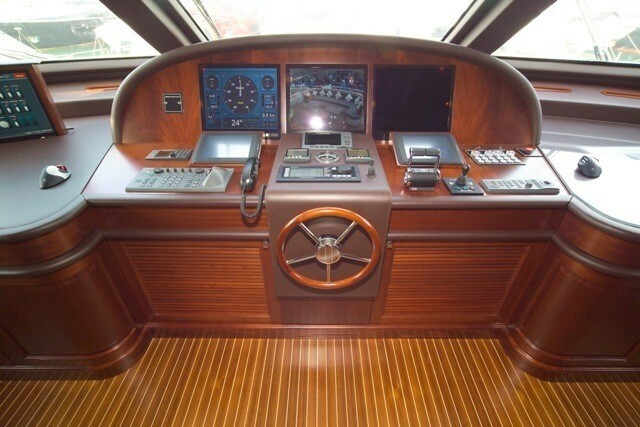 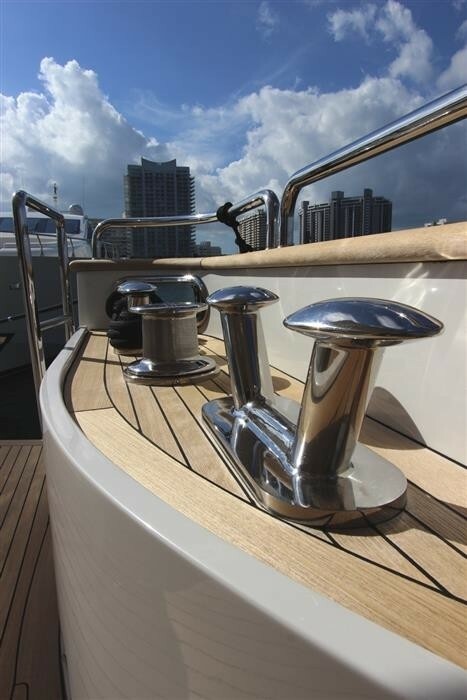 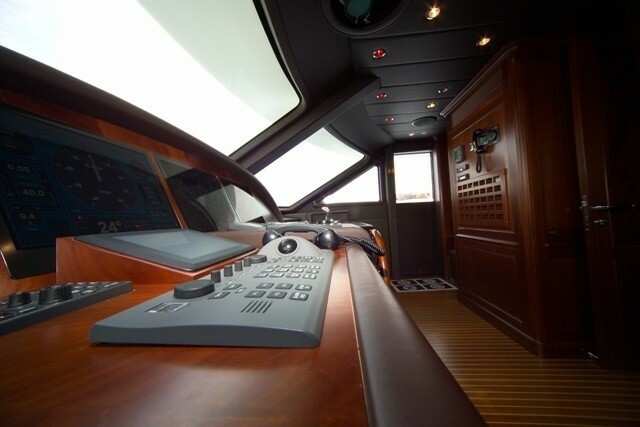 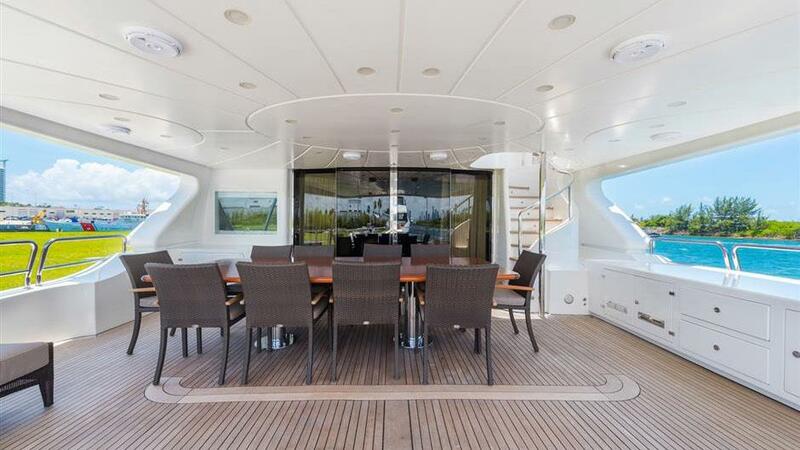 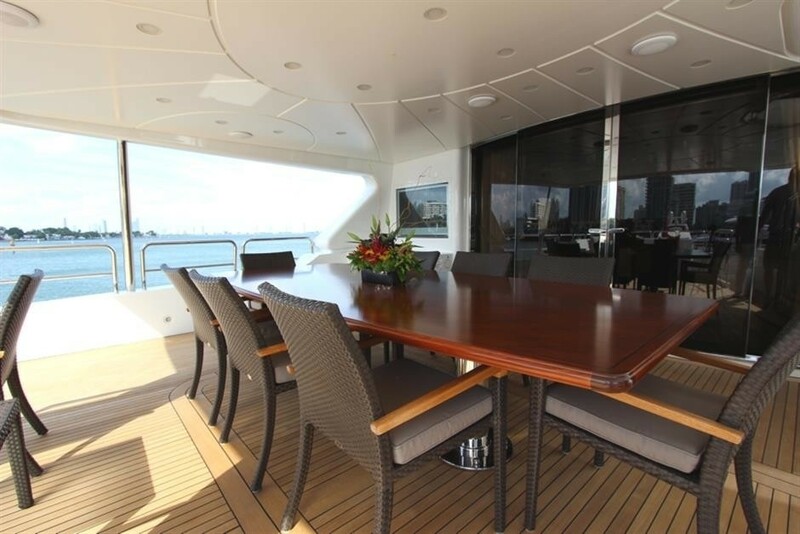 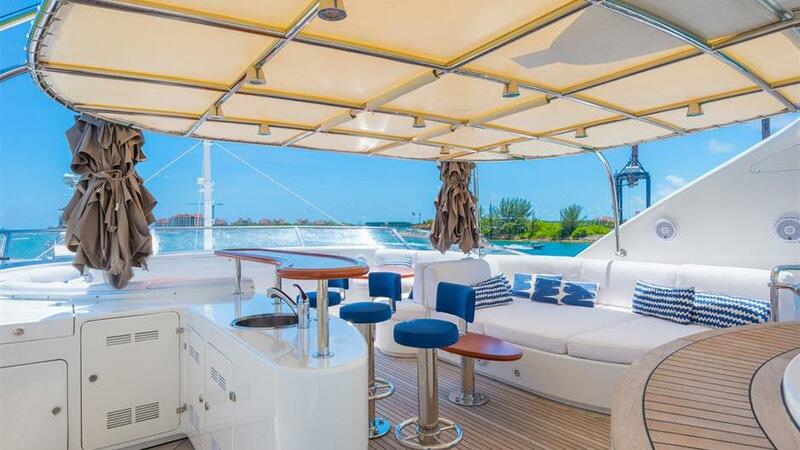 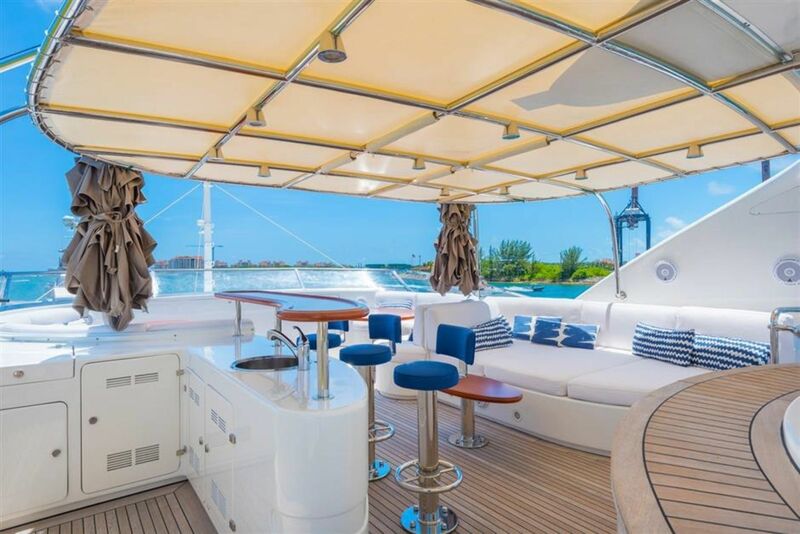 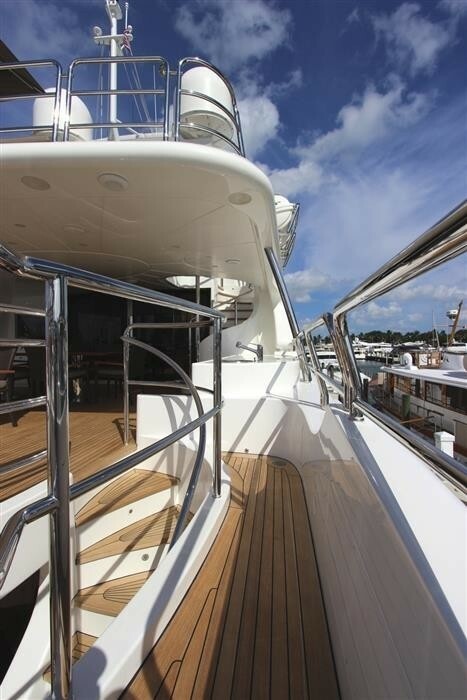 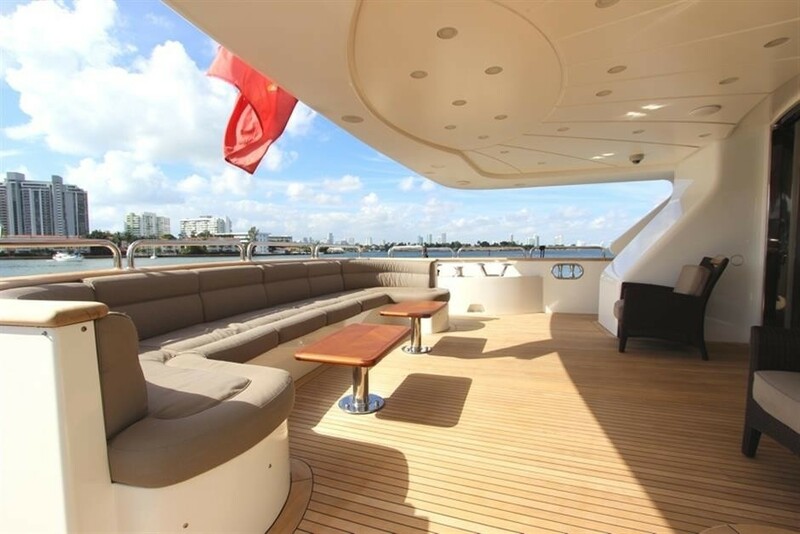 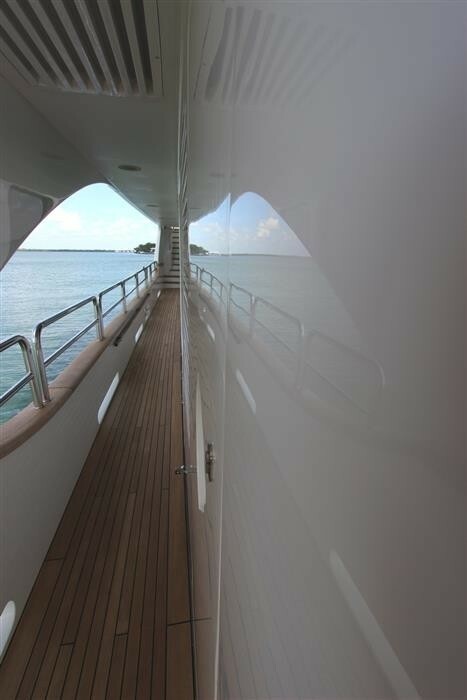 The yacht is also suitable for corporate charters. 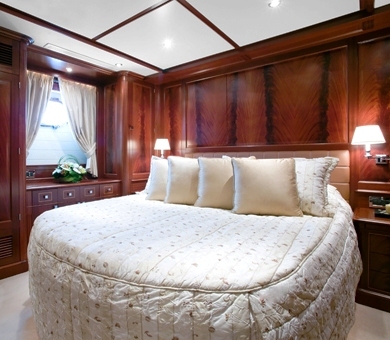 ANDIAMO can accommodate up to 10 guests in 5 cabins. 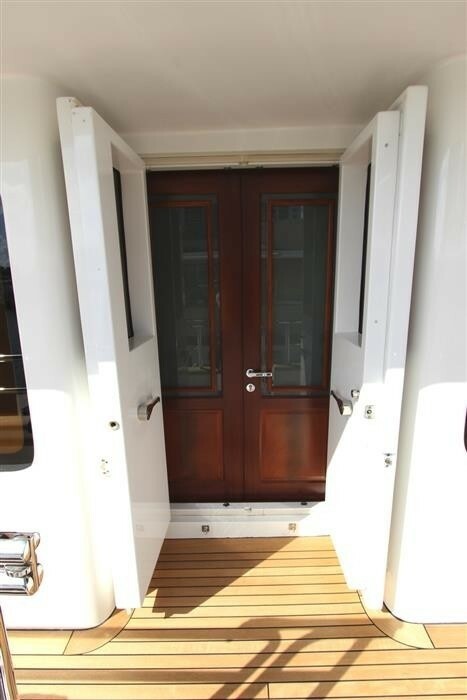 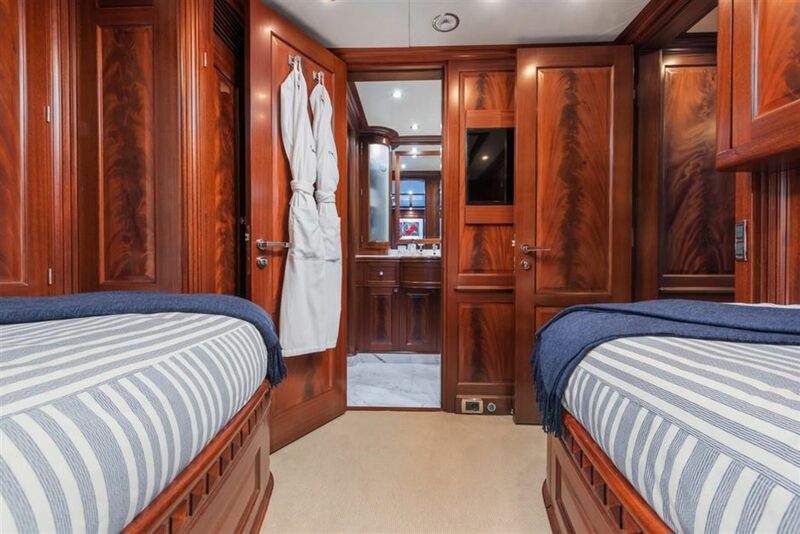 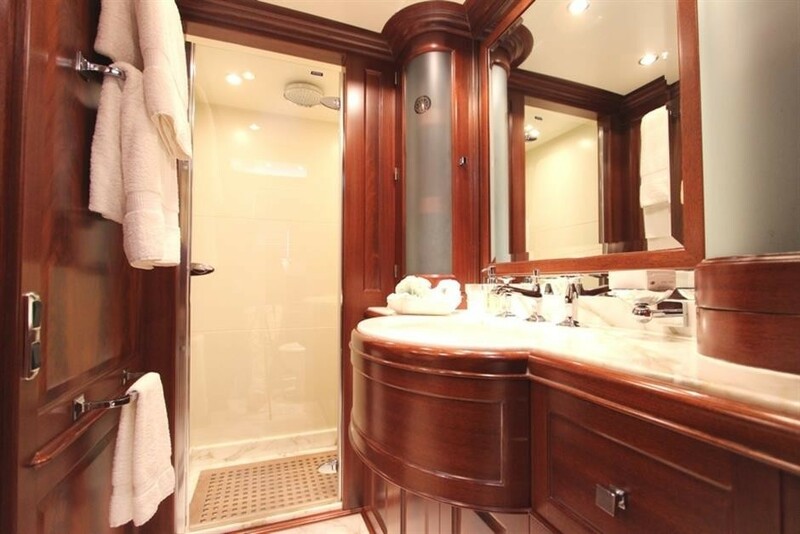 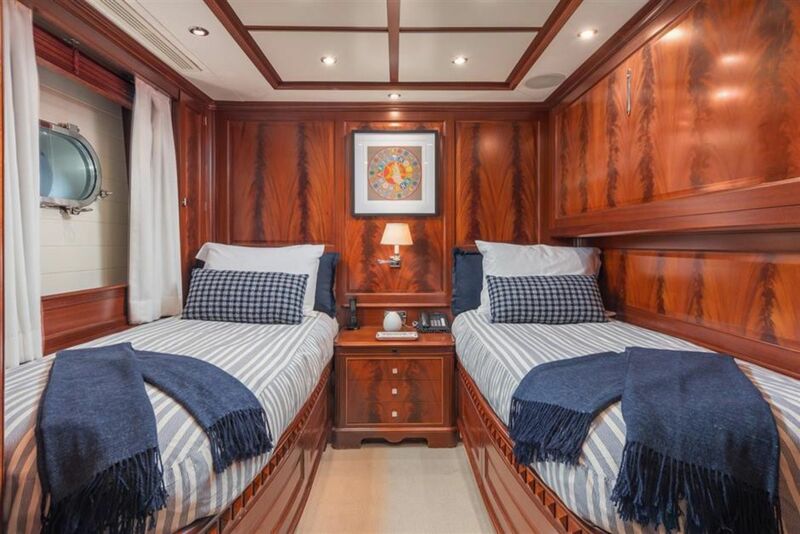 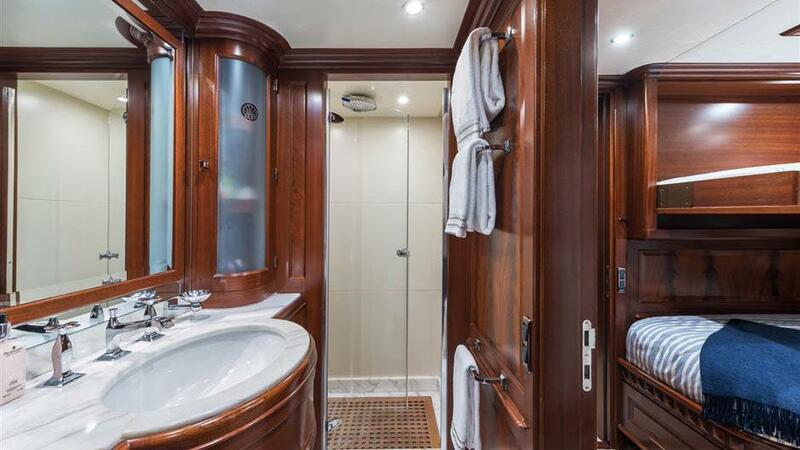 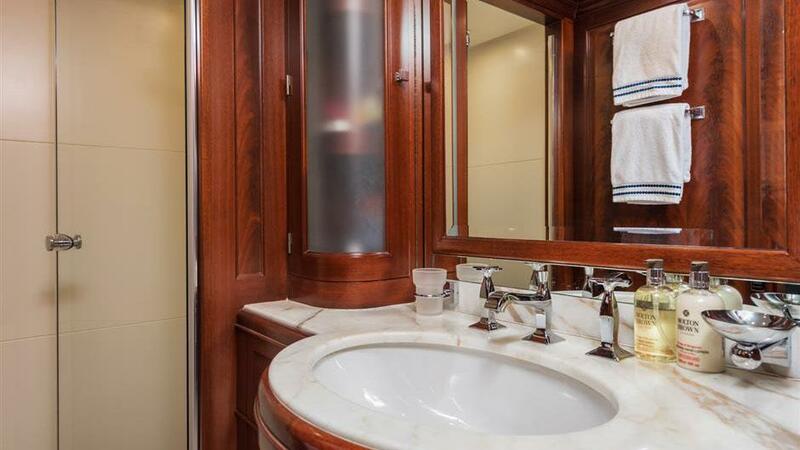 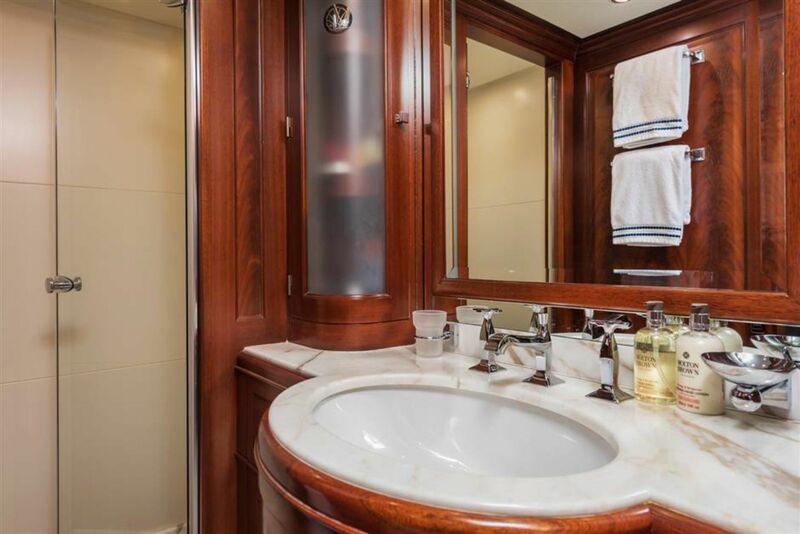 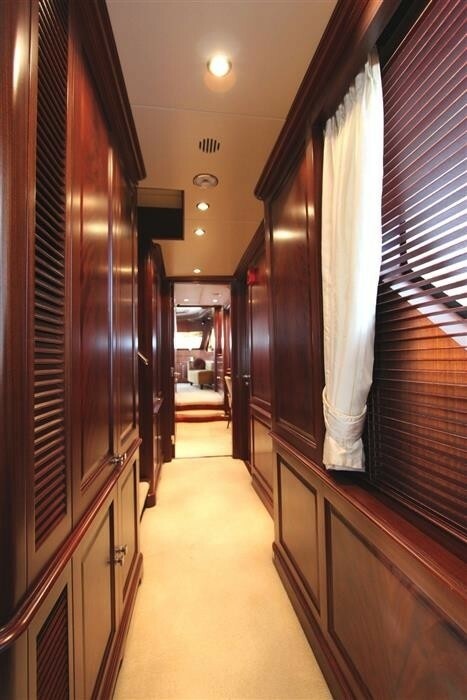 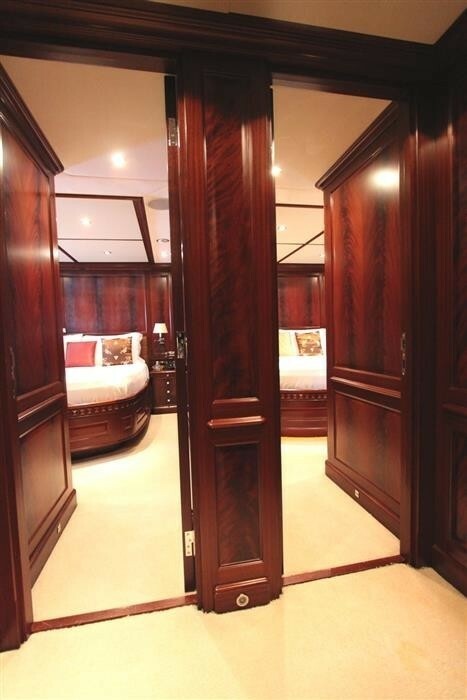 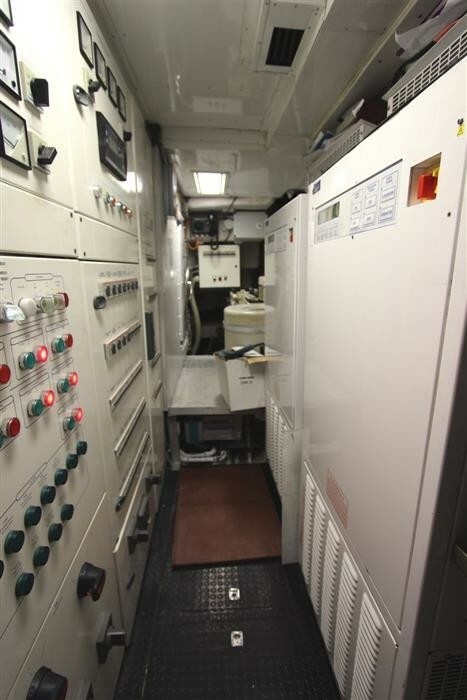 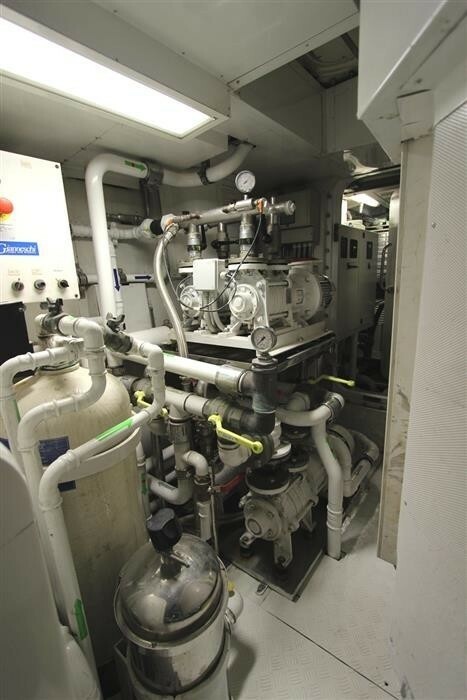 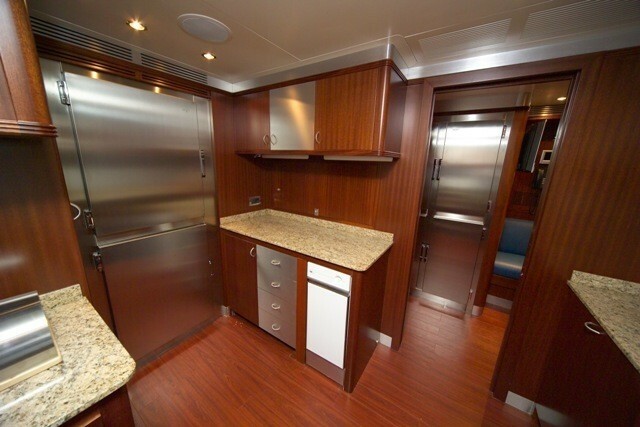 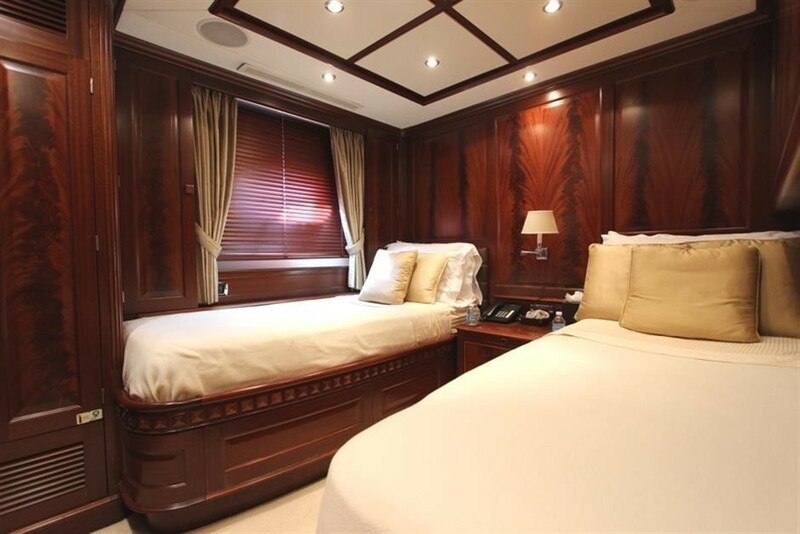 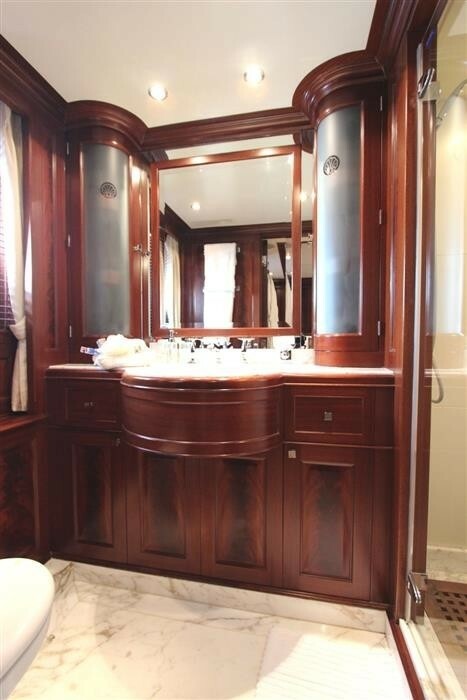 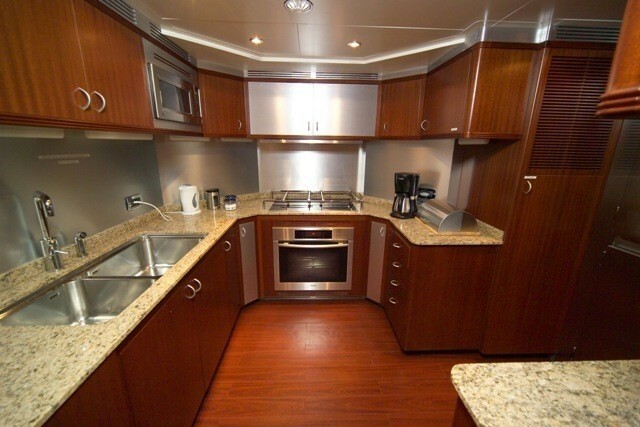 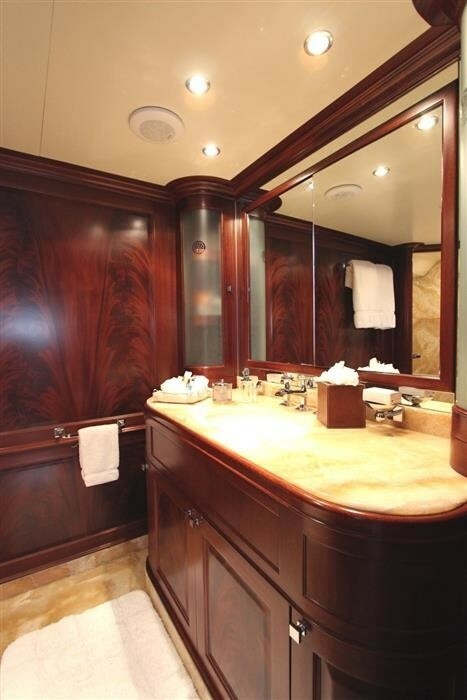 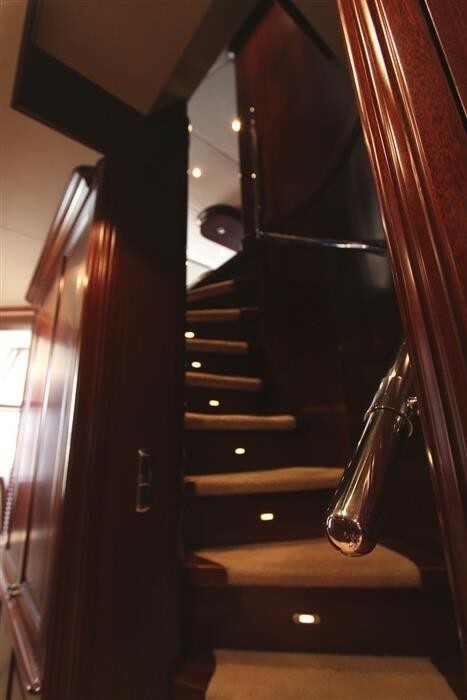 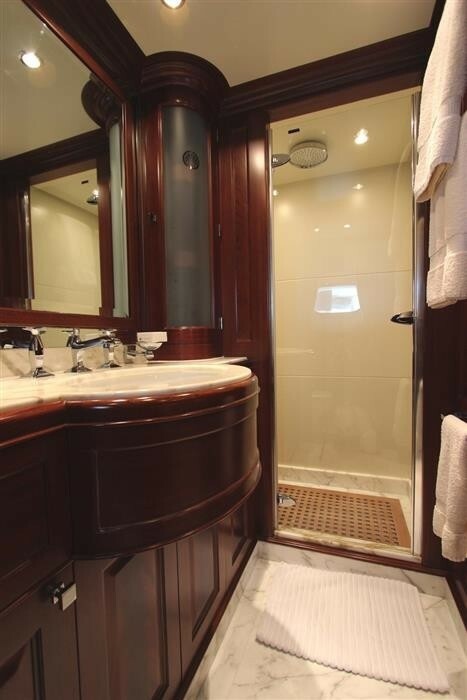 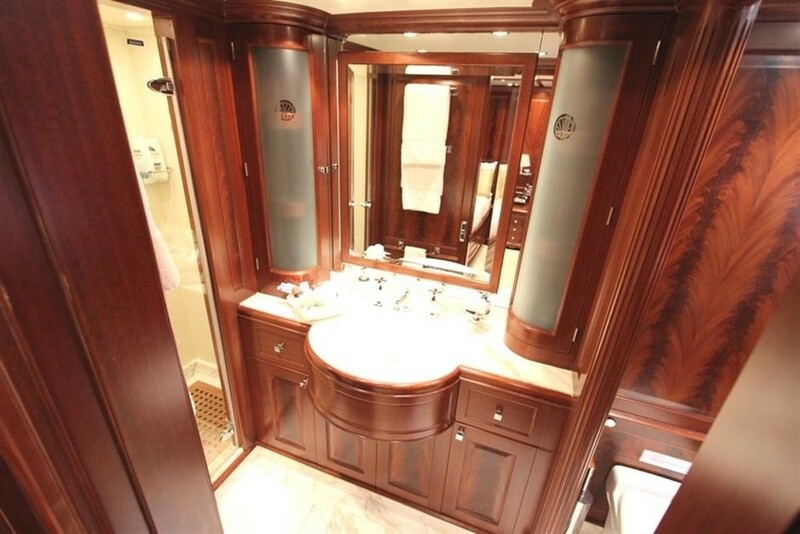 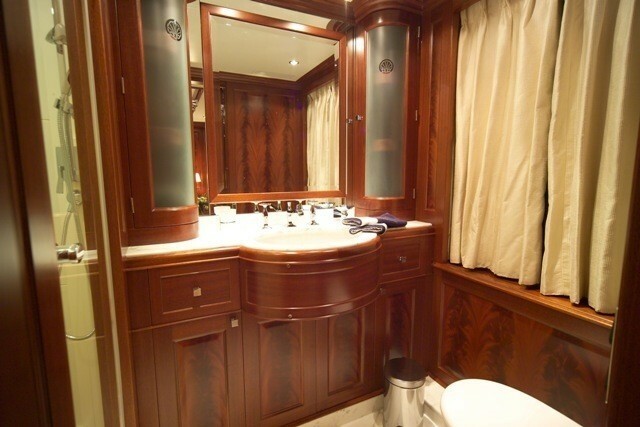 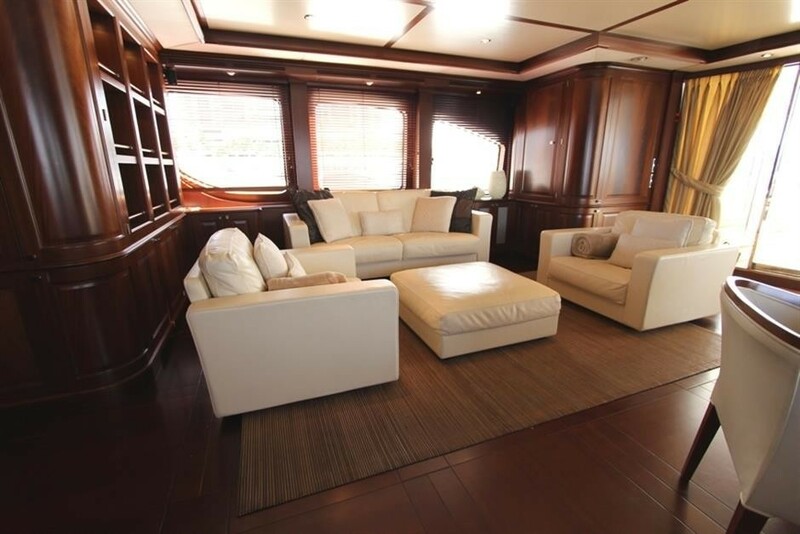 Her Master Cabin is located on the main deck with an en-suite bathroom with shower and twin hand basin. 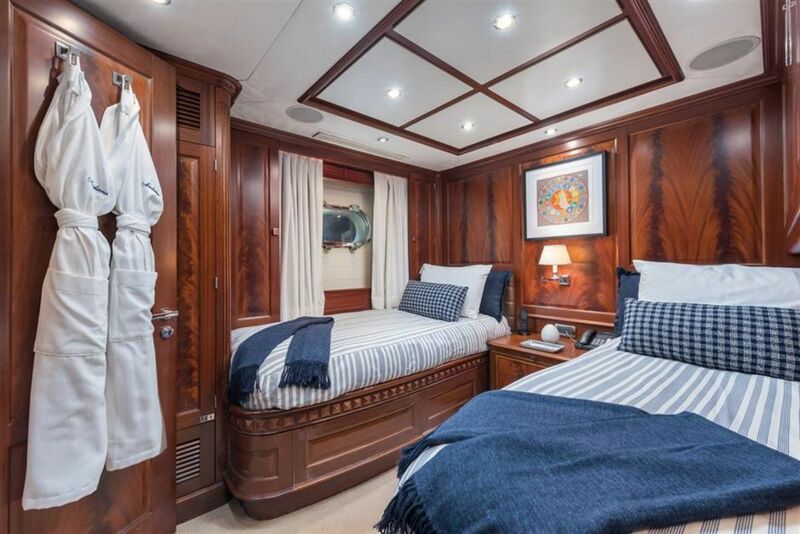 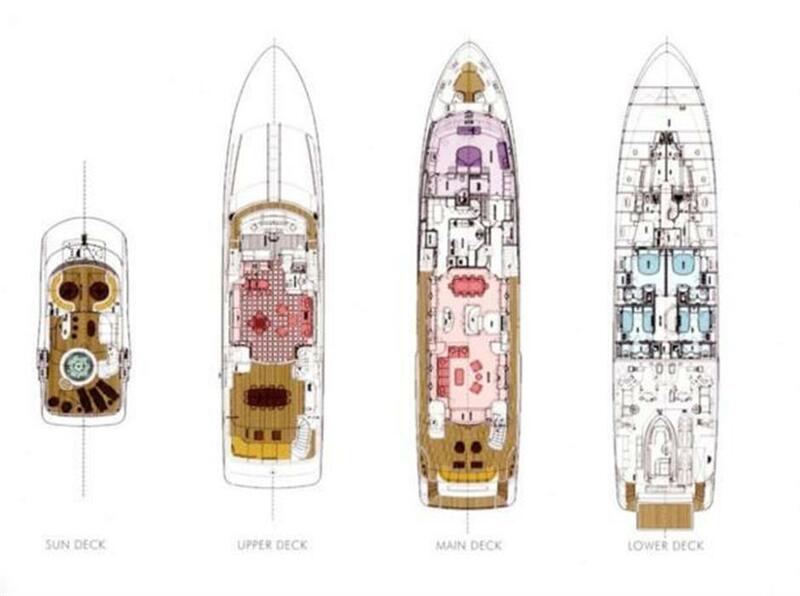 The remaining cabins on the lower deck include two Double VIP guest cabins with ensuite shower and two twin guest cabins with Pullman beds and en-suite shower. 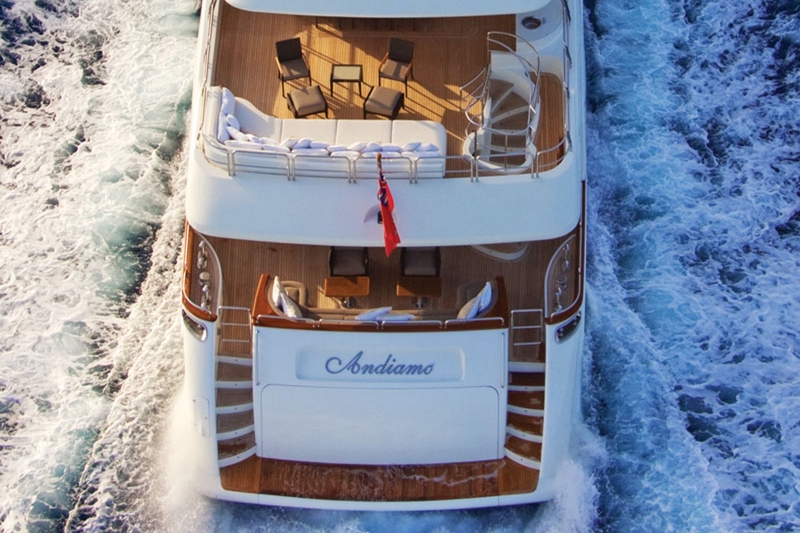 Luxury yacht ANDIAMO has a great selection of extras and amenities on board including the following Tenders & Toys: A Castoldi 18' jet tender with 135hp, two 2 person Yamaha wave-runners 1300(license needed), a Rescue tender- 3.4M with 30hp, Waterskis, a Wakeboard, Inflatable toys including a Banana, doughnut etc, Snorkeling equipment, Swimming ladder and shower. 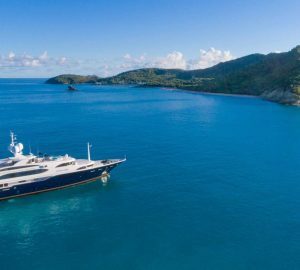 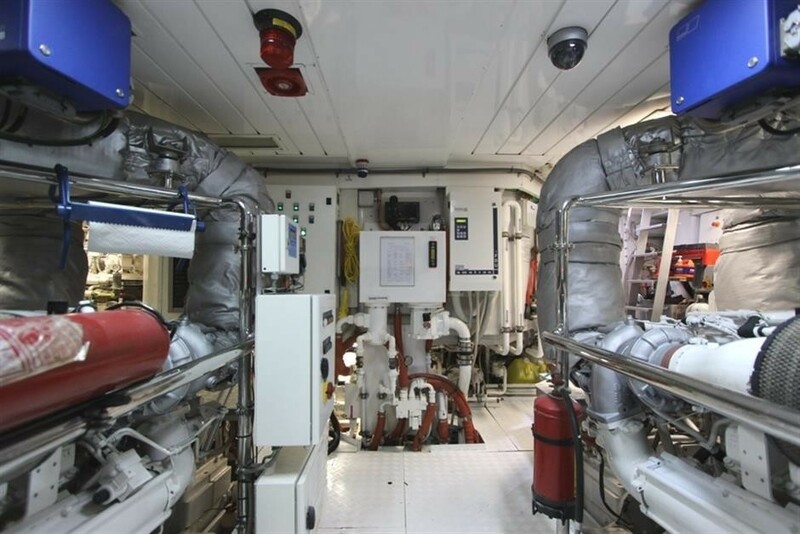 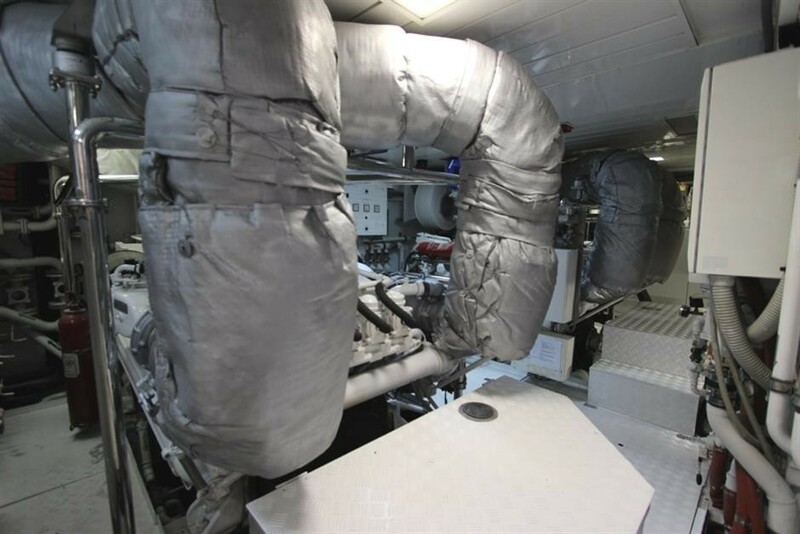 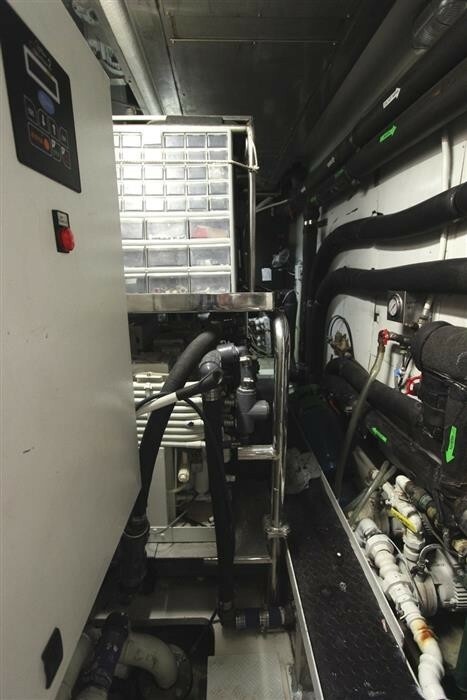 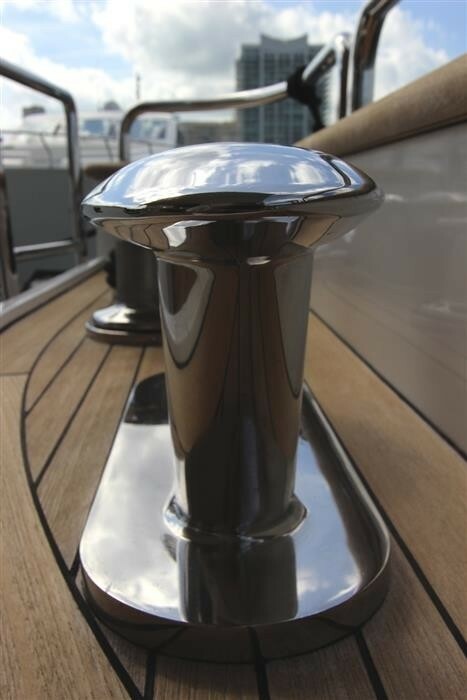 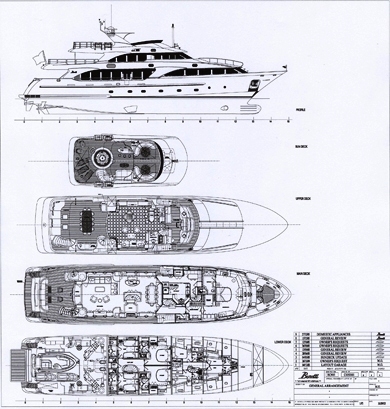 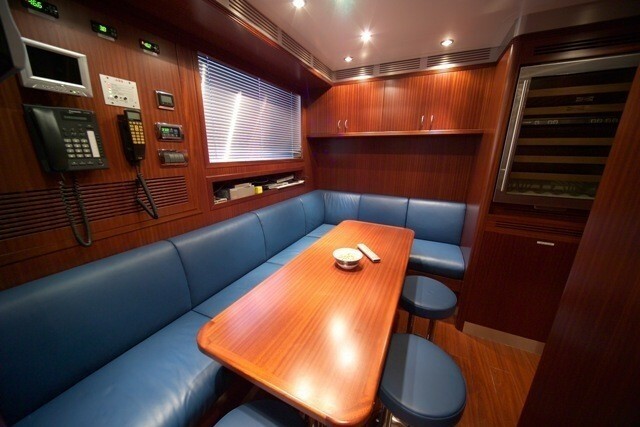 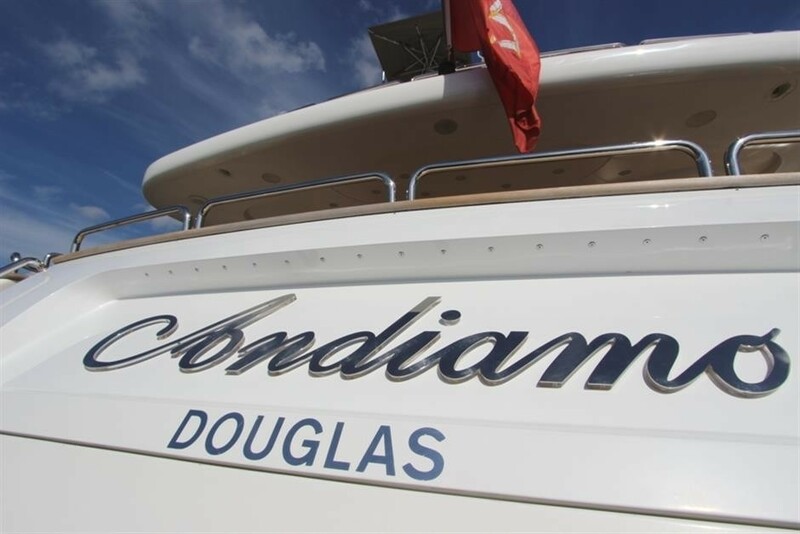 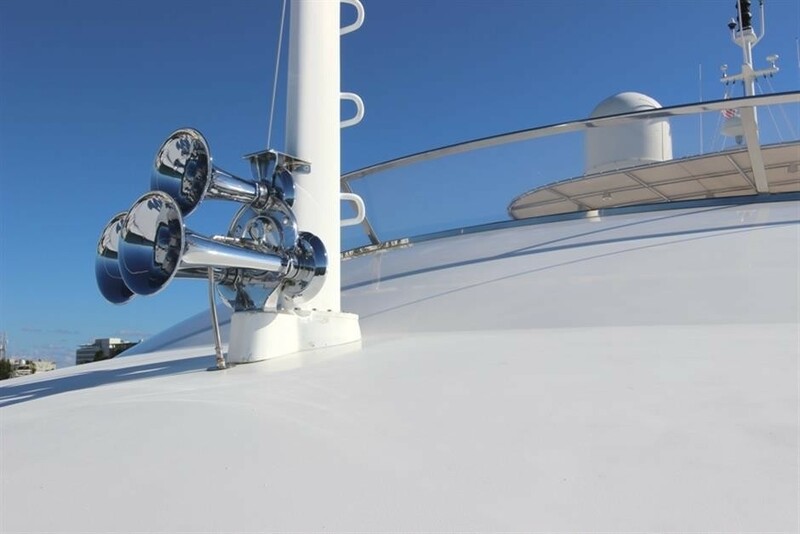 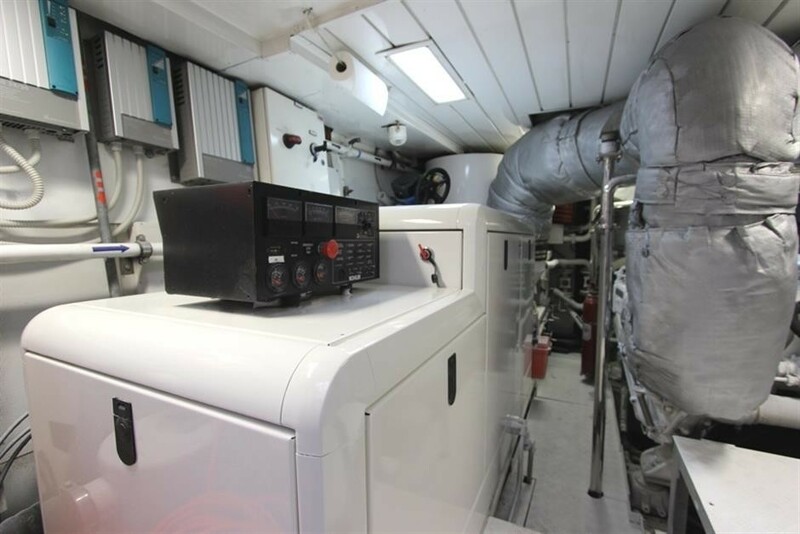 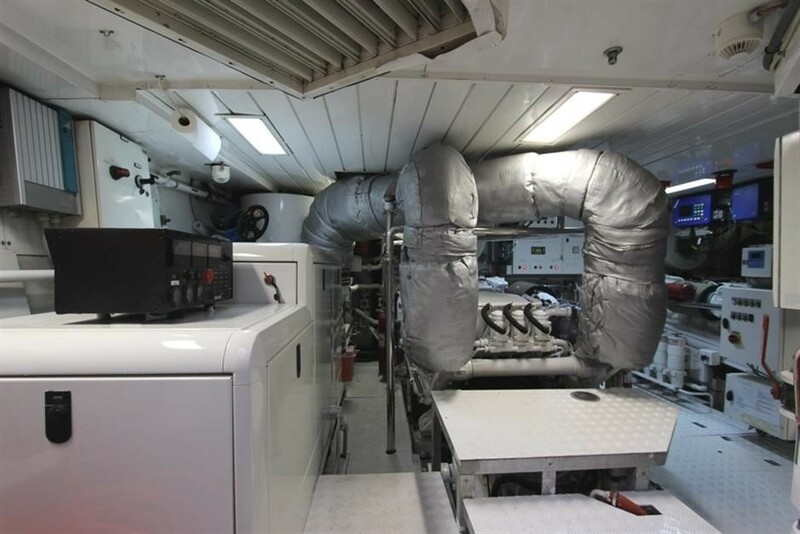 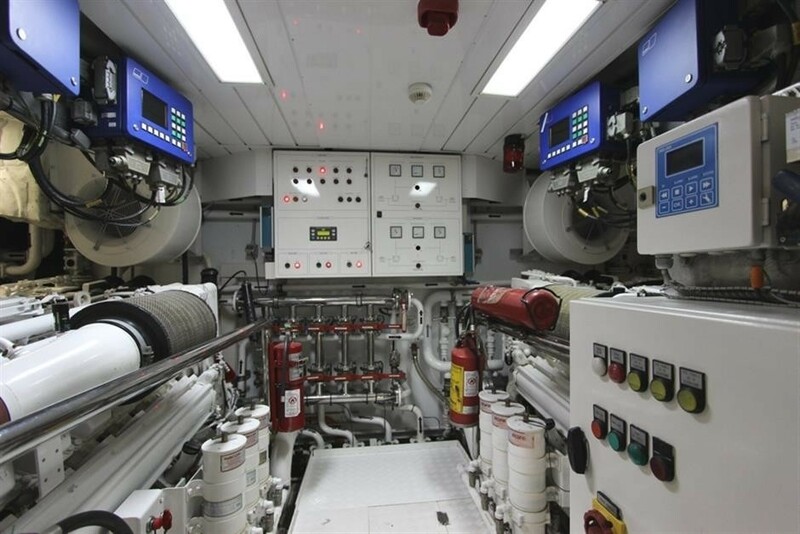 Communications include VSAT Sea-tel 4006 ( Data and VolP, wireless throughout the yacht), Inmarsat Mini-M, GSM, WIFI , Satcom C. Audio Visual Equipment and Deck Facilities include Bose surround sound in master cabin, main saloon and upper saloon. 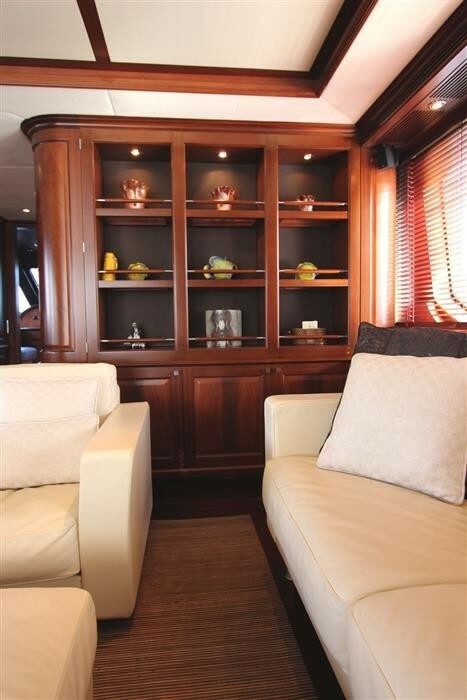 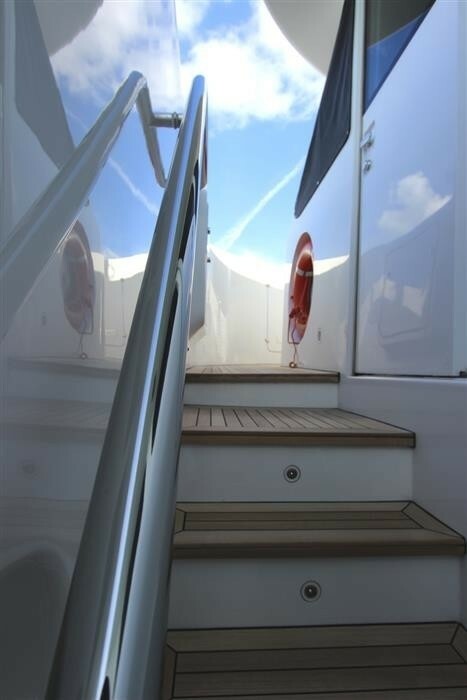 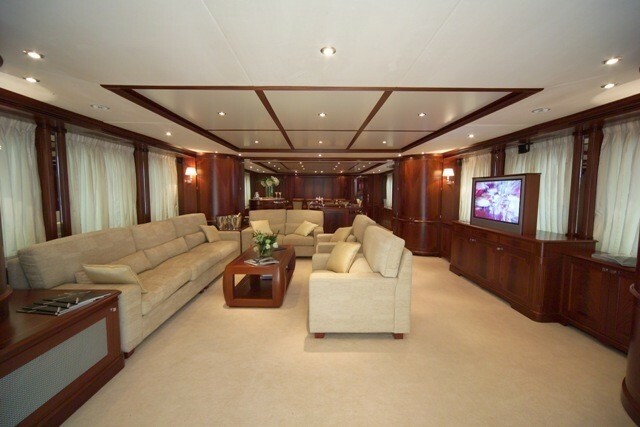 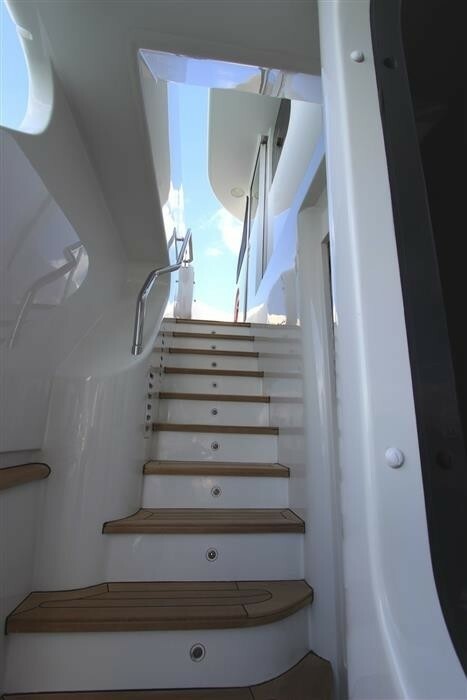 Sky sat TV in main/upper saloon, upper exterior aft deck and guest cabins. 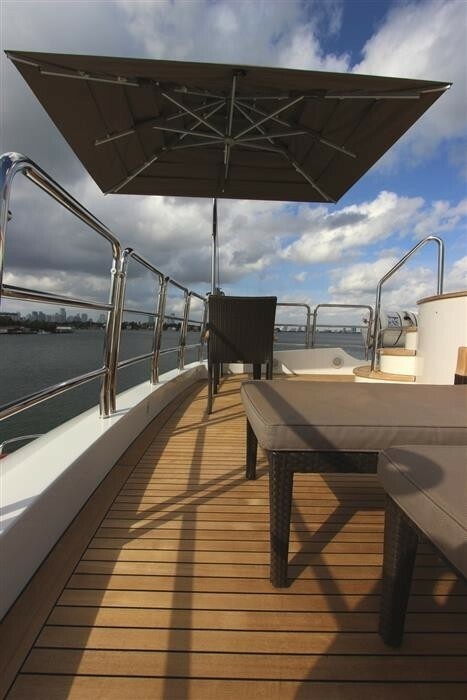 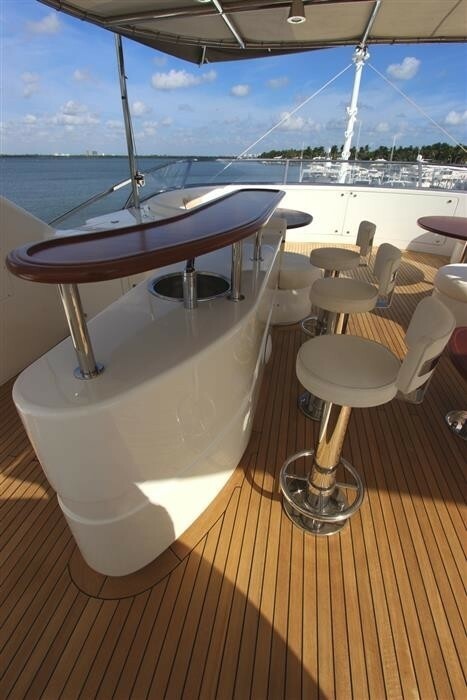 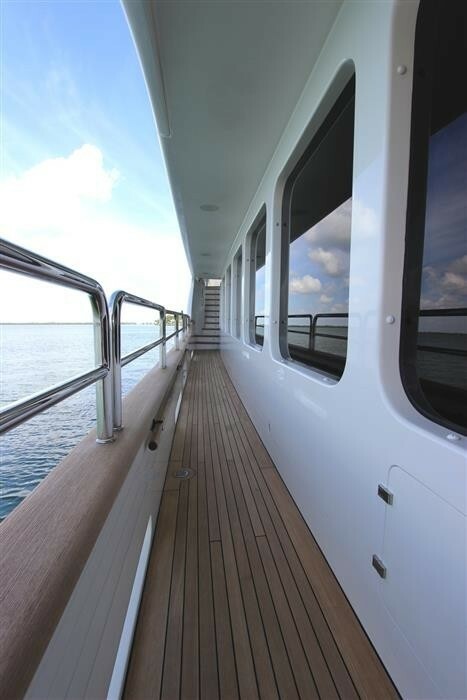 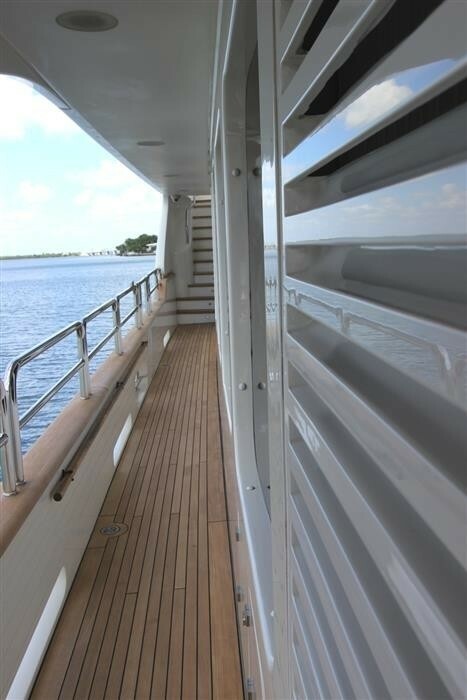 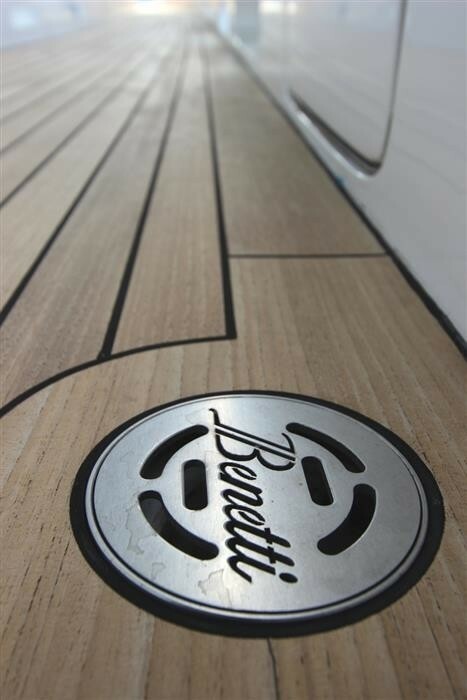 Bose sound system, I-pod docking stations, Sea-tel TV on the Sundeck.